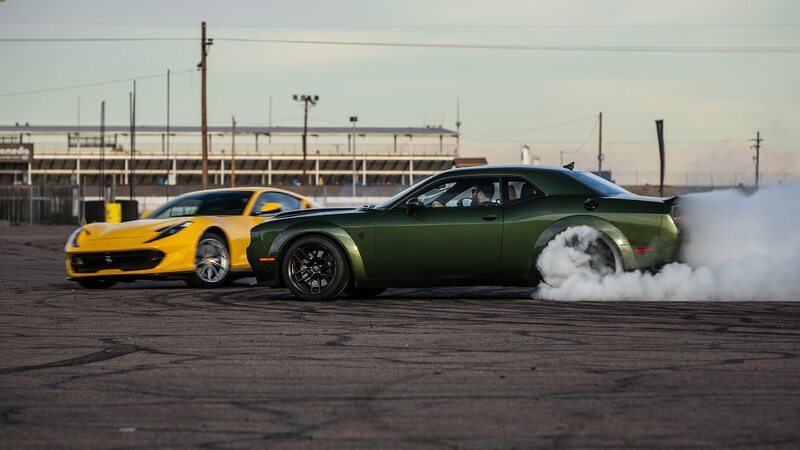 The two big differences between how we test straight-line acceleration versus actual drag racing are surface and tires. 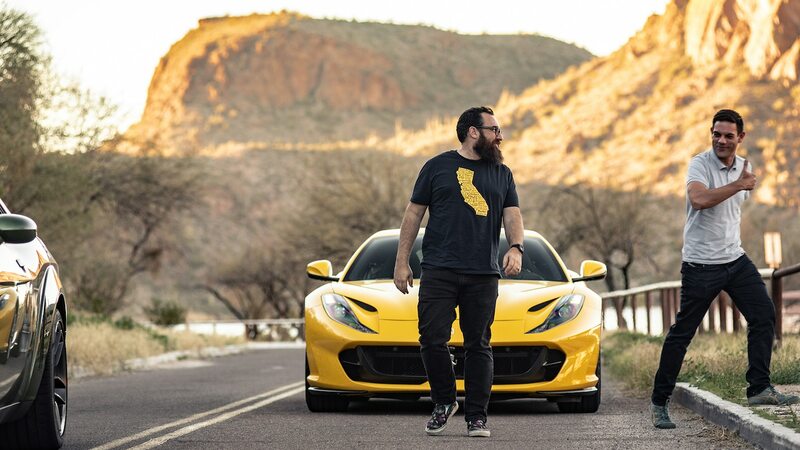 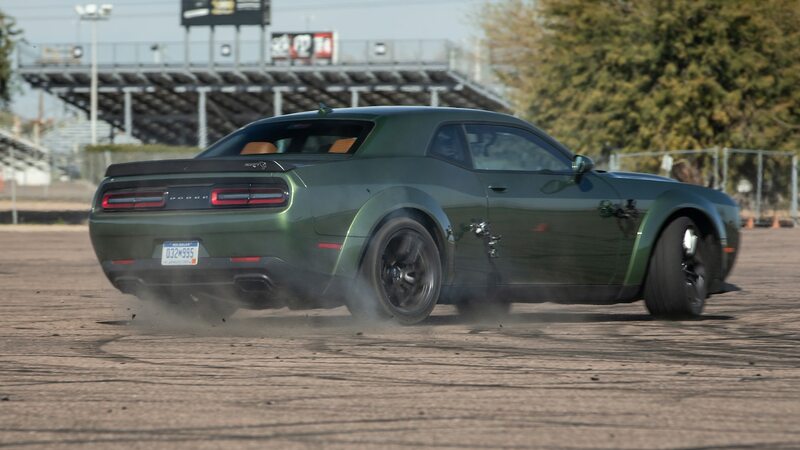 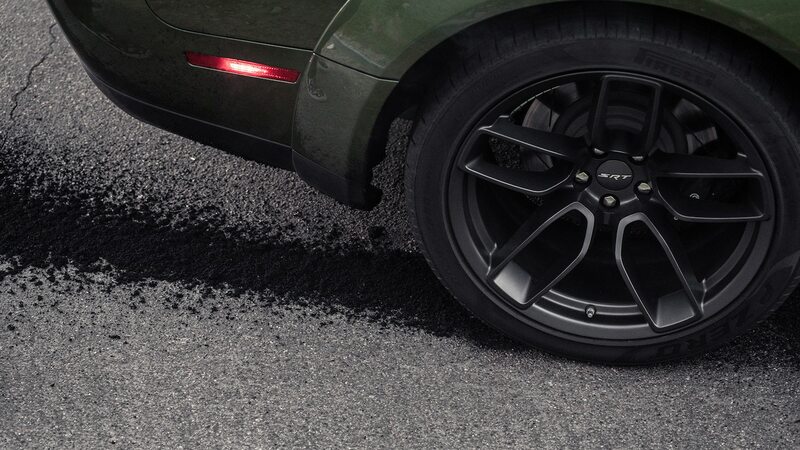 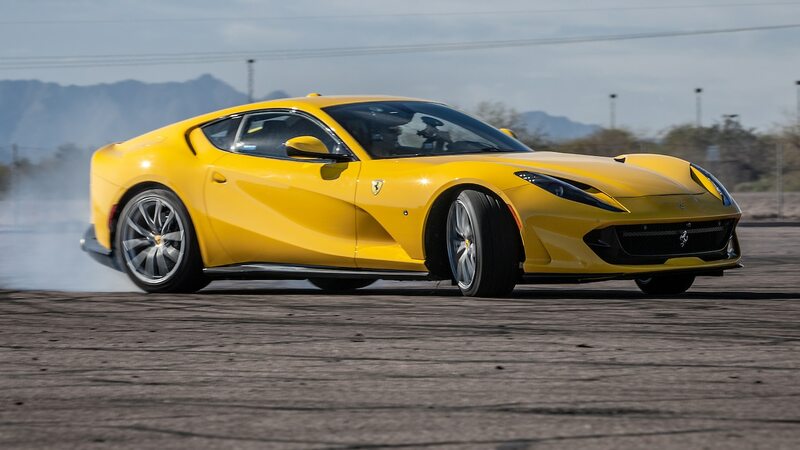 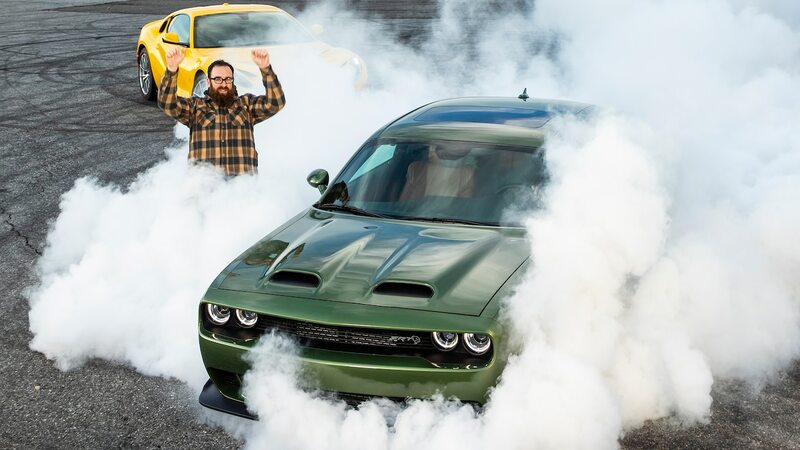 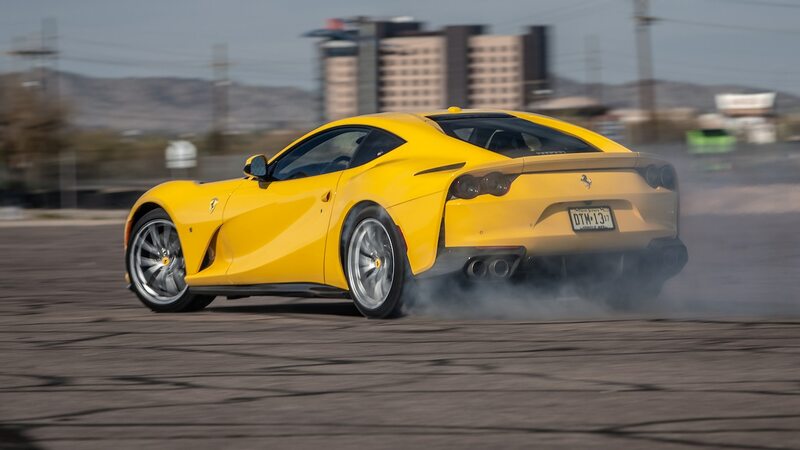 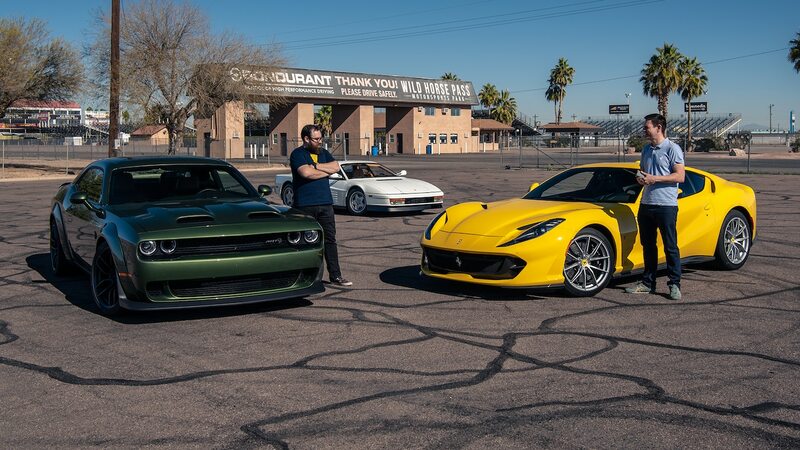 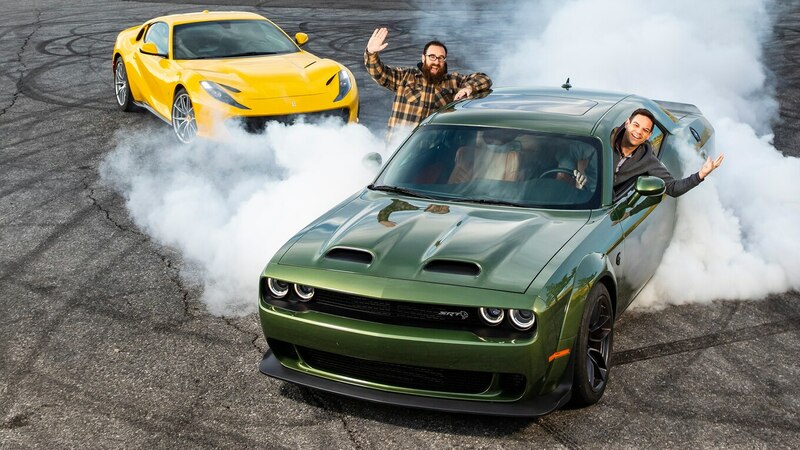 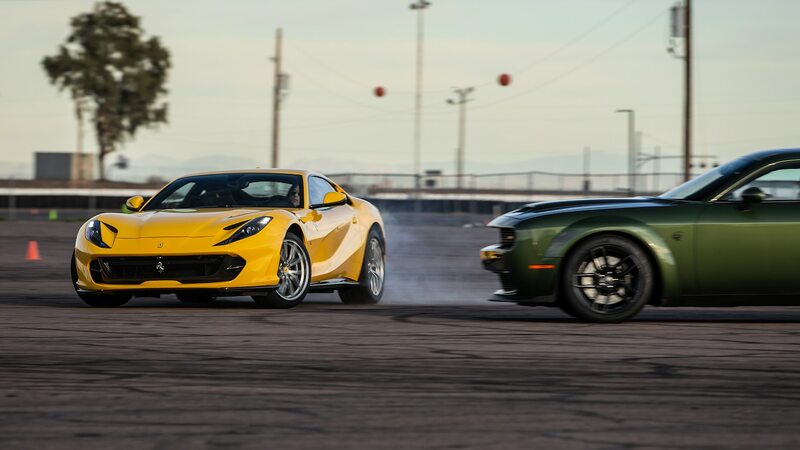 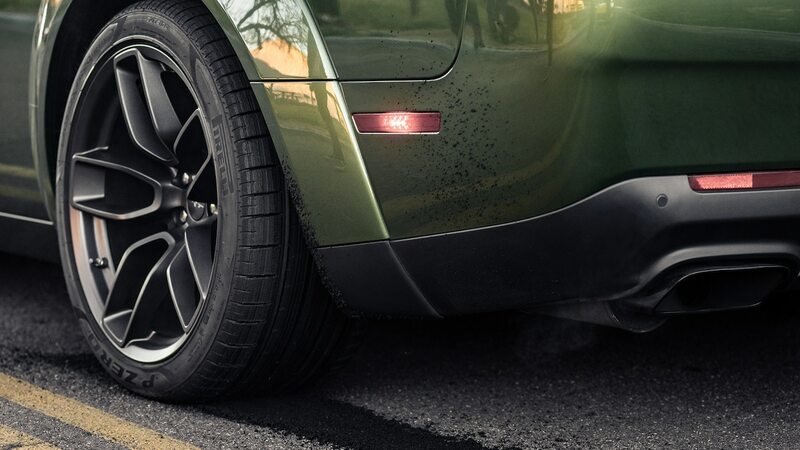 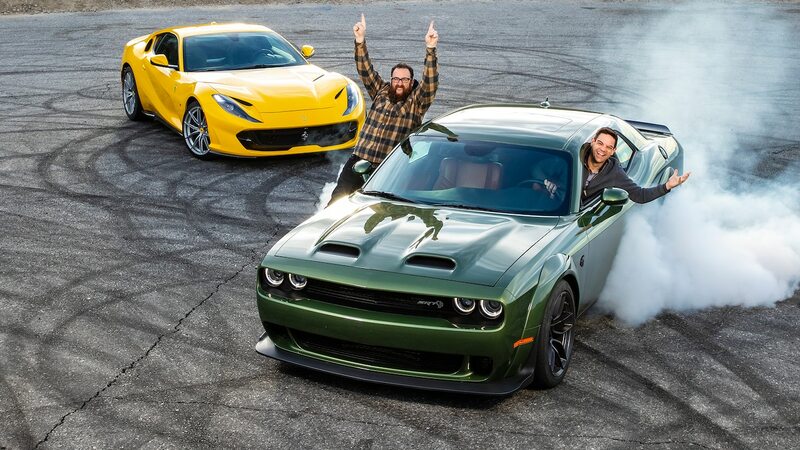 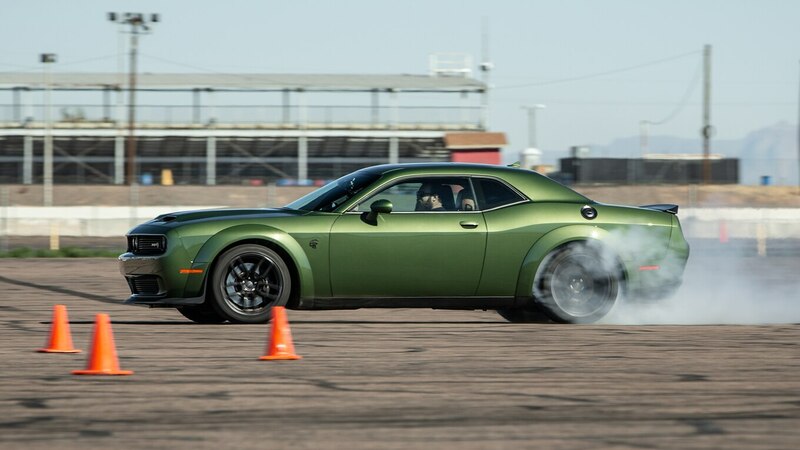 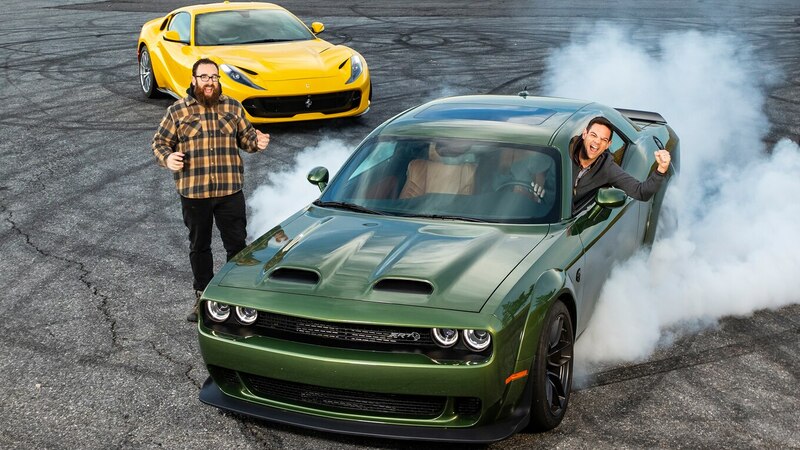 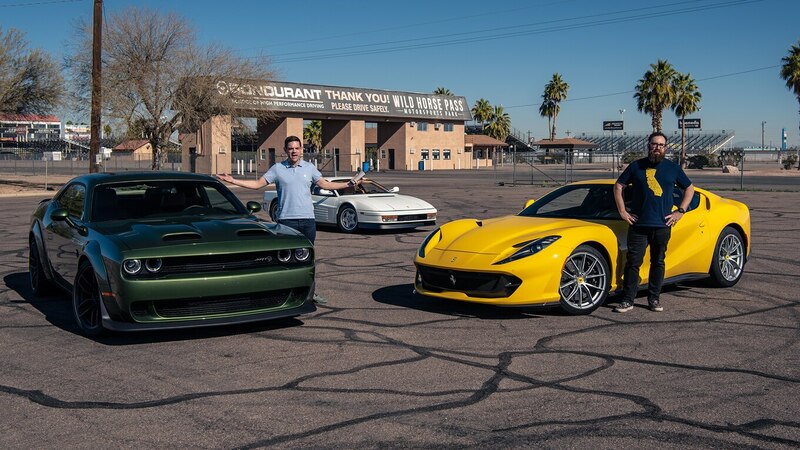 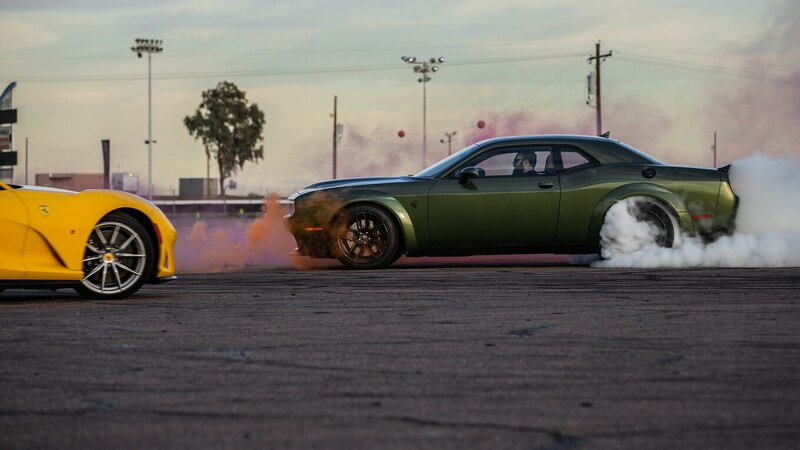 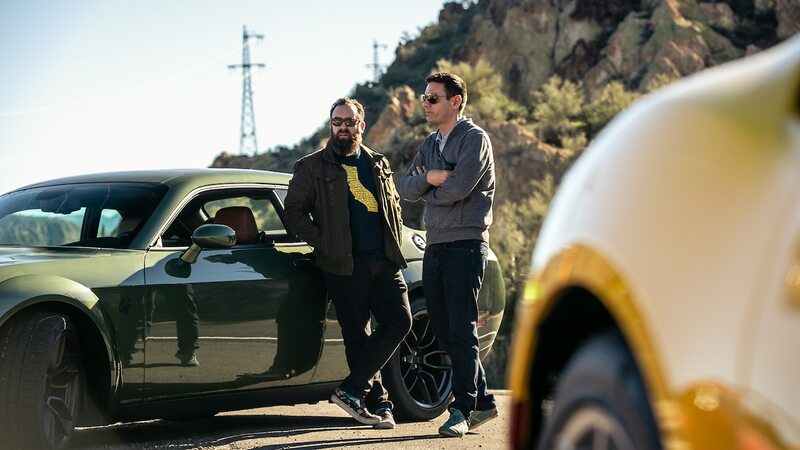 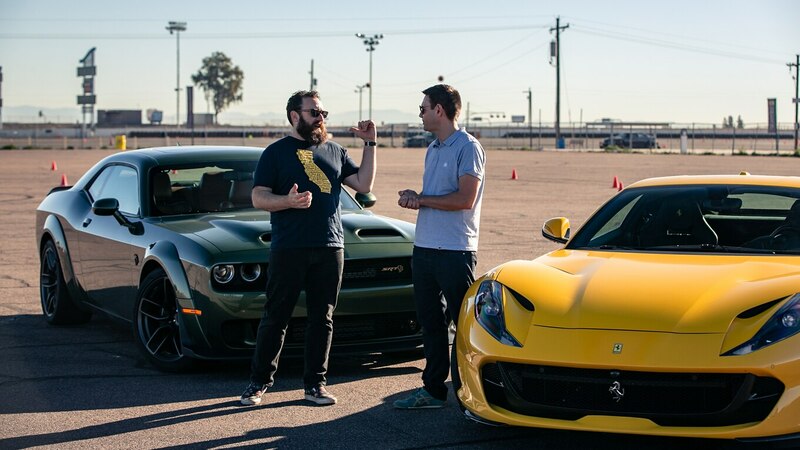 When our test team hooks up the Vbox and records 0-60 and quarter-mile times for the 2019 Dodge Challenger SRT Hellcat Redeye and 2018 Ferrari 812 Superfast, we run on street tires on asphalt. 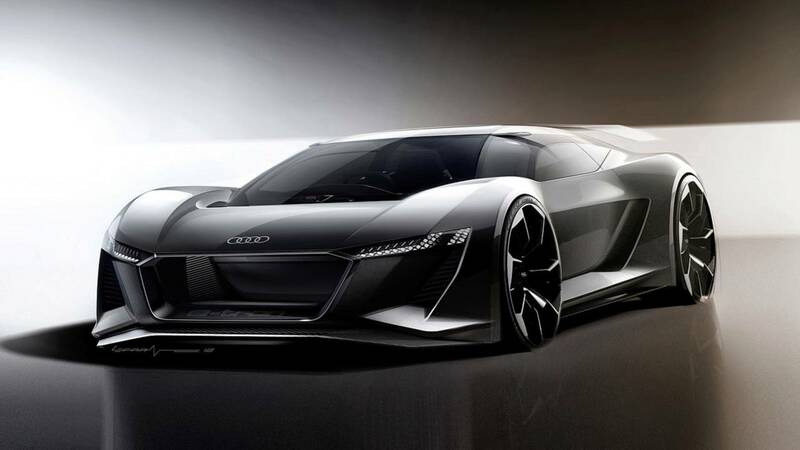 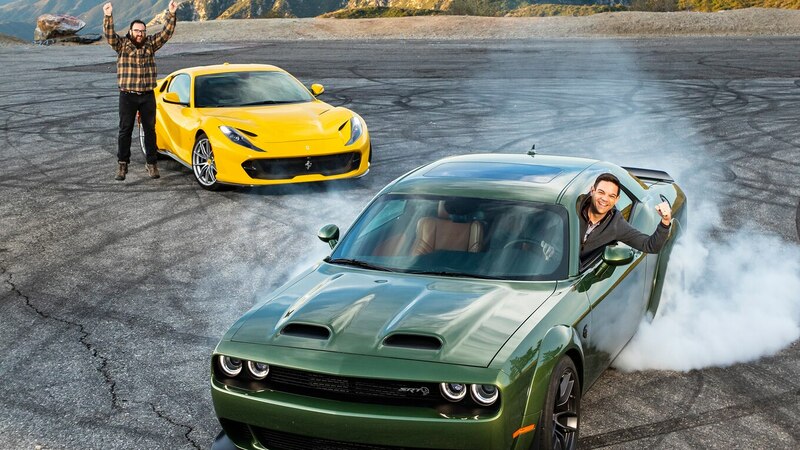 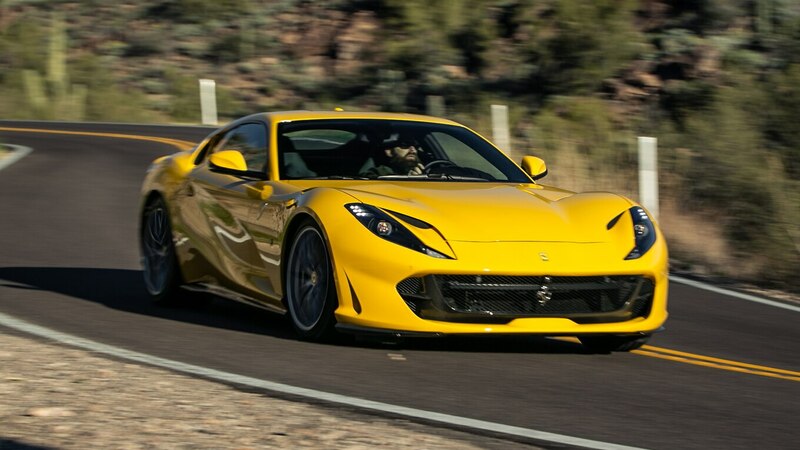 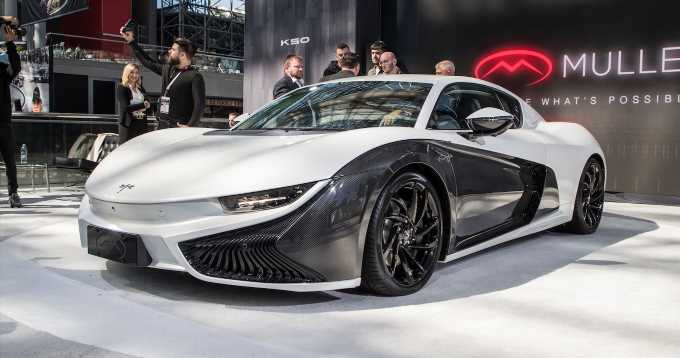 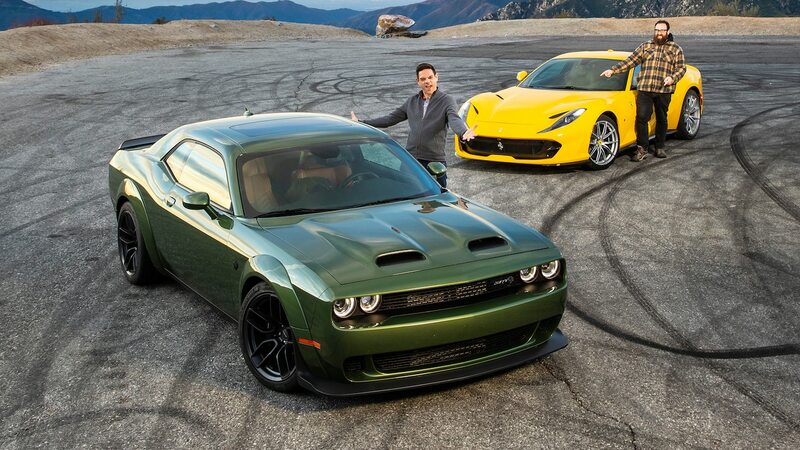 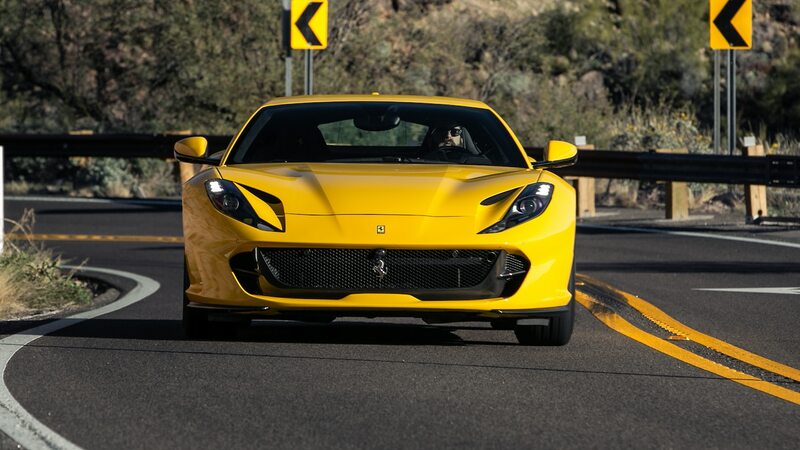 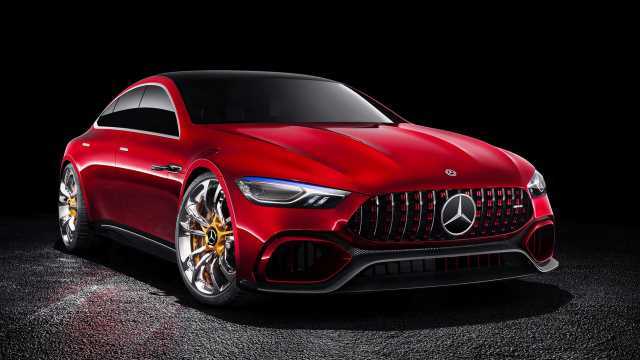 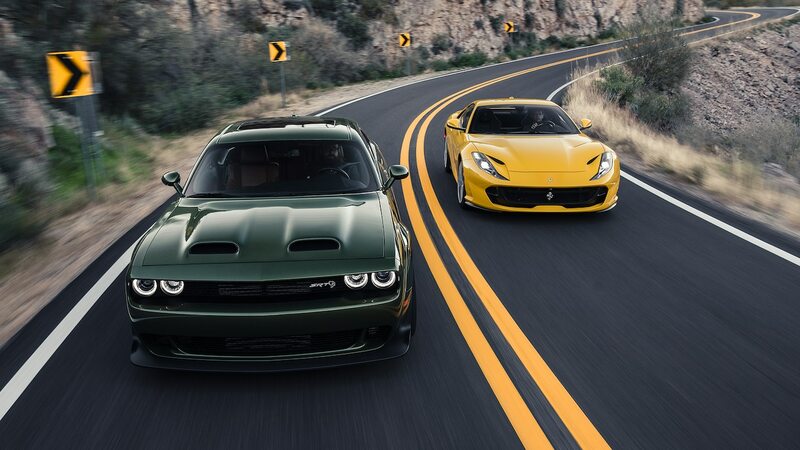 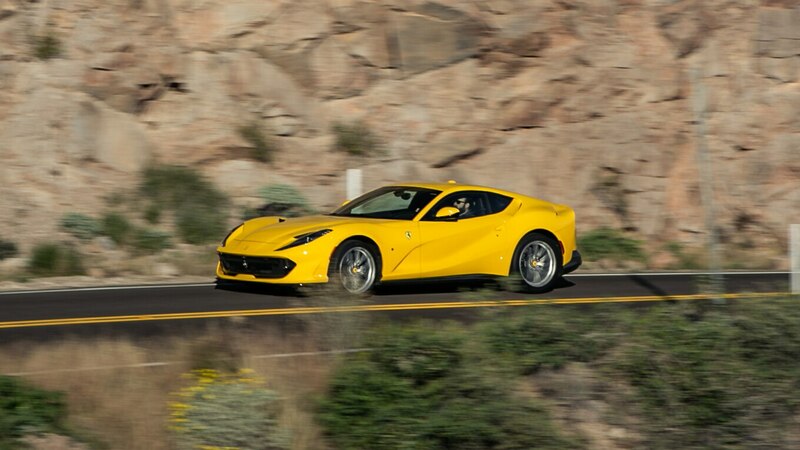 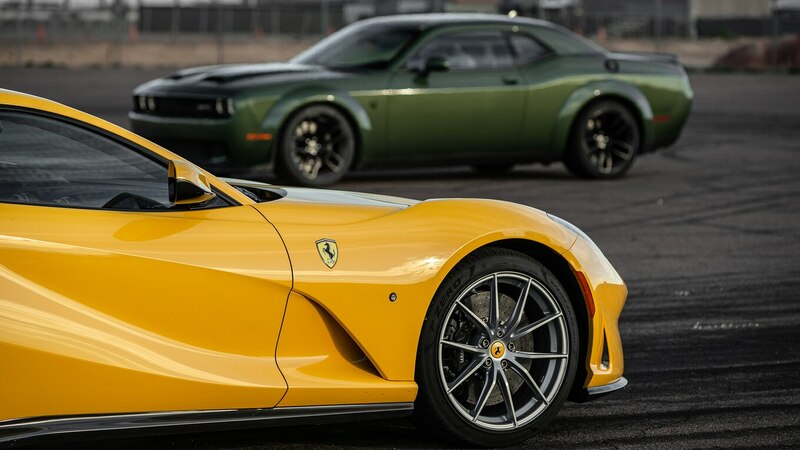 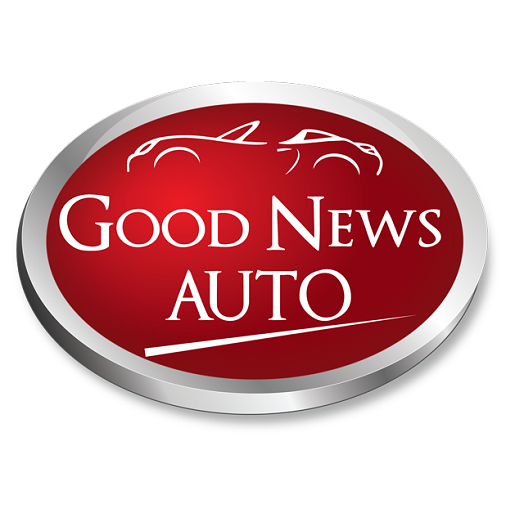 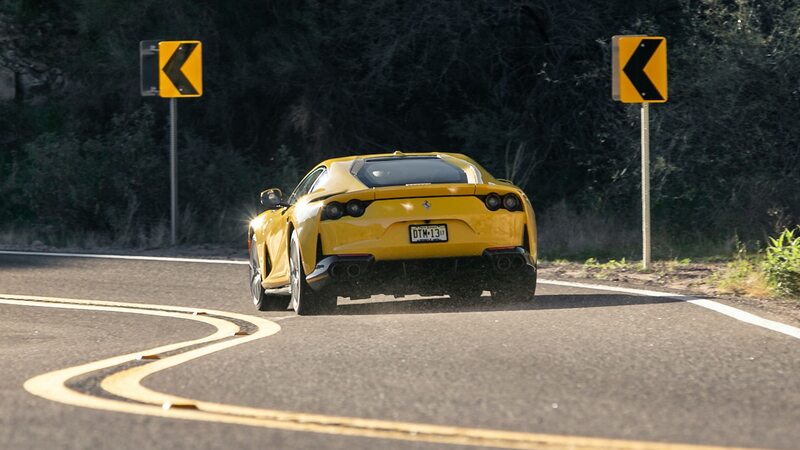 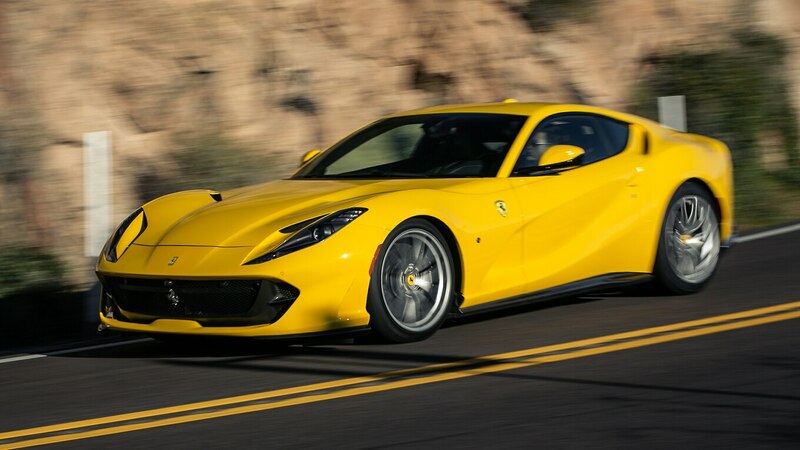 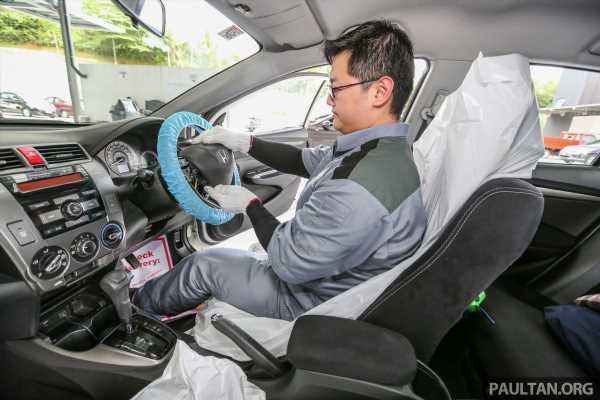 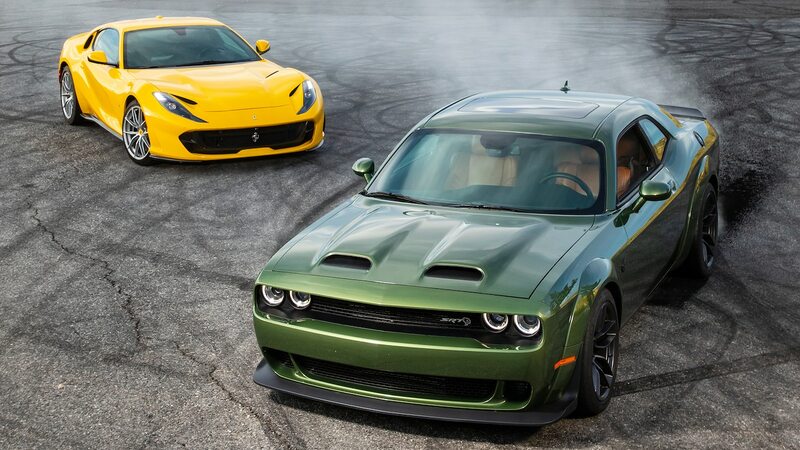 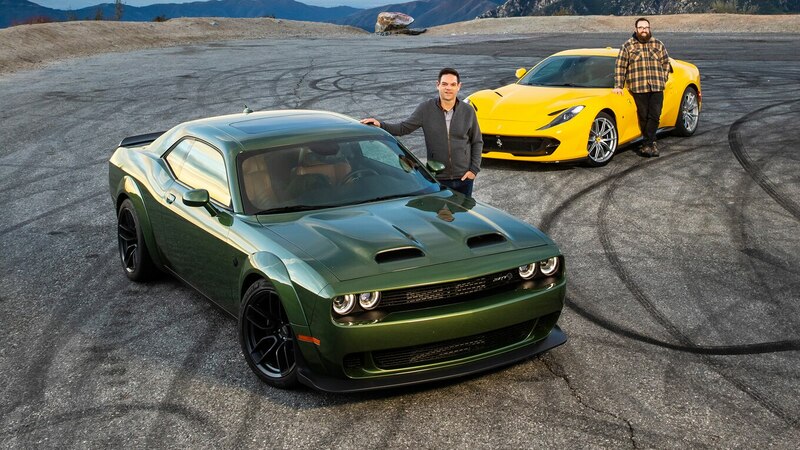 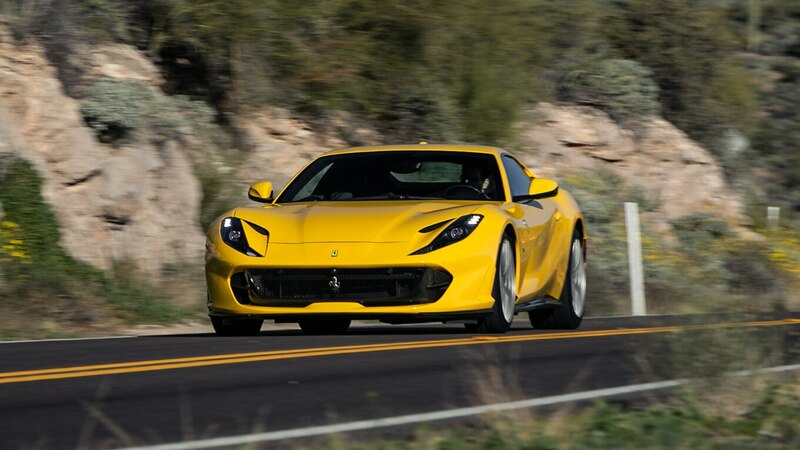 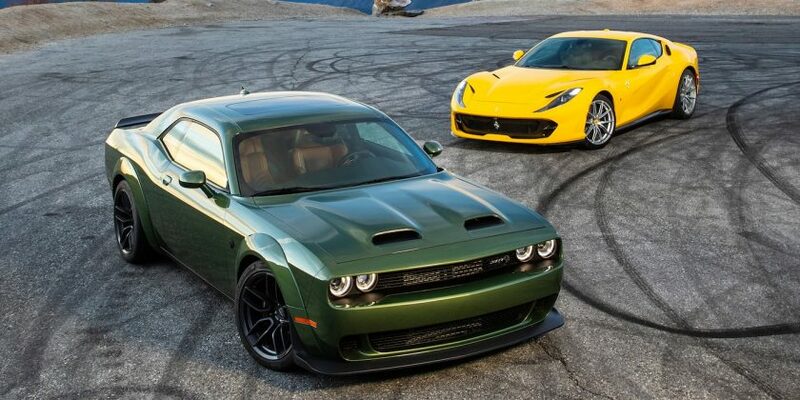 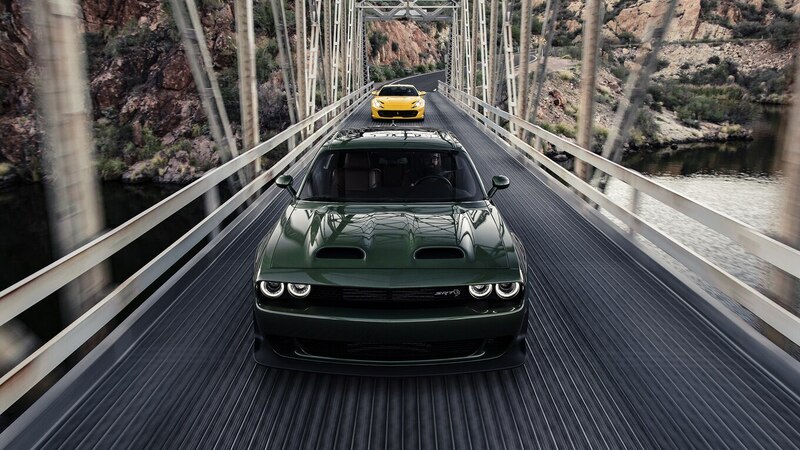 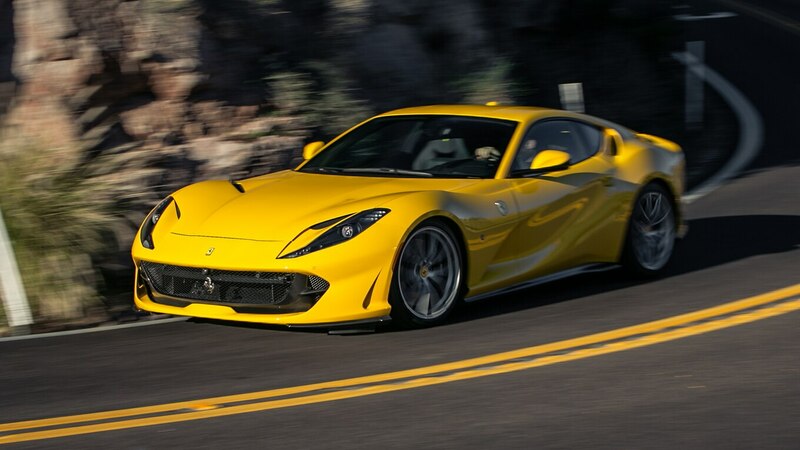 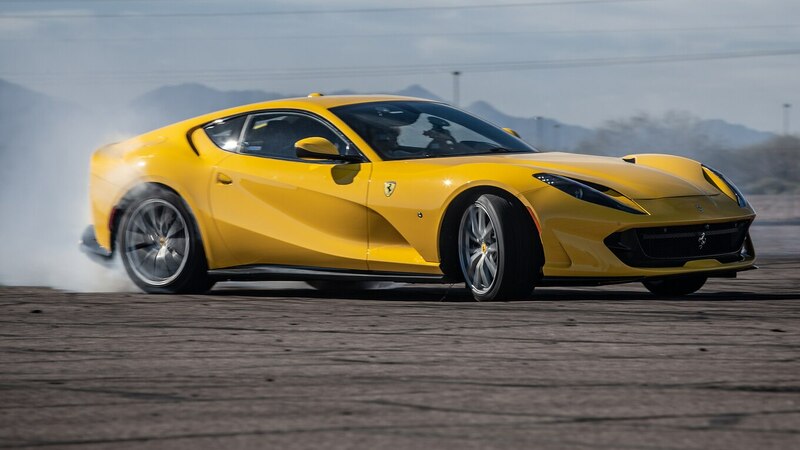 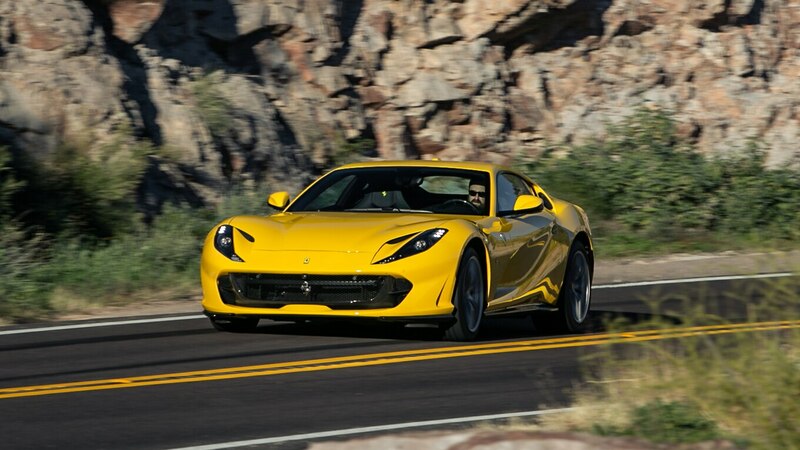 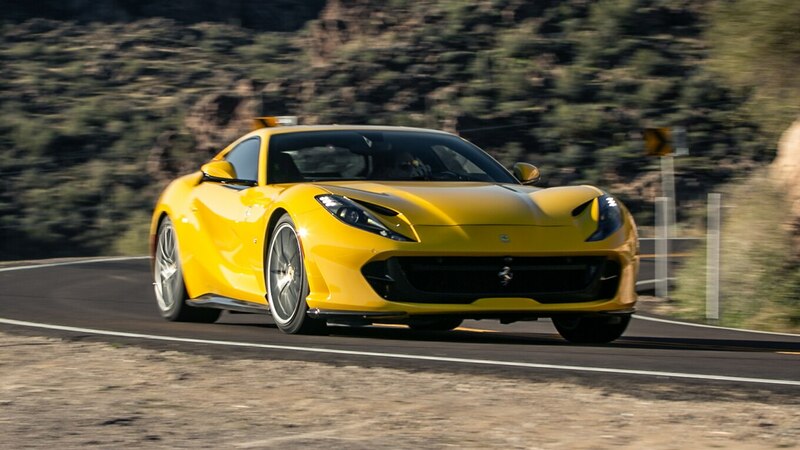 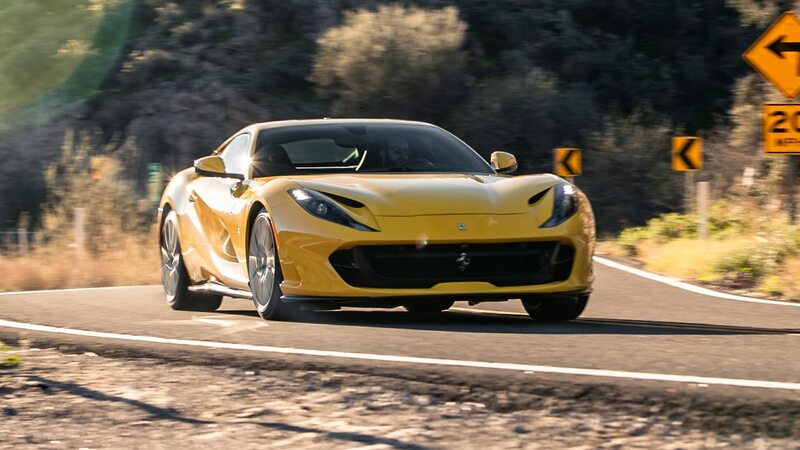 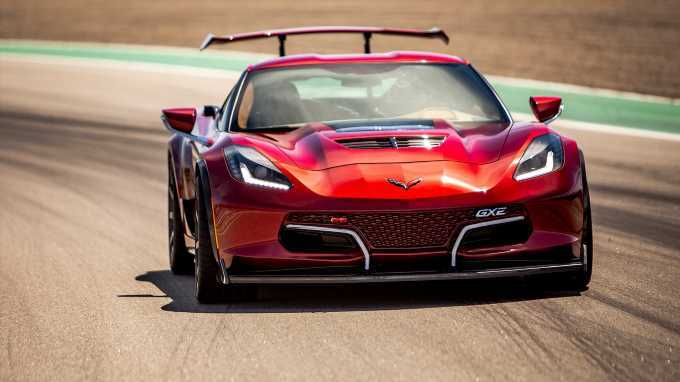 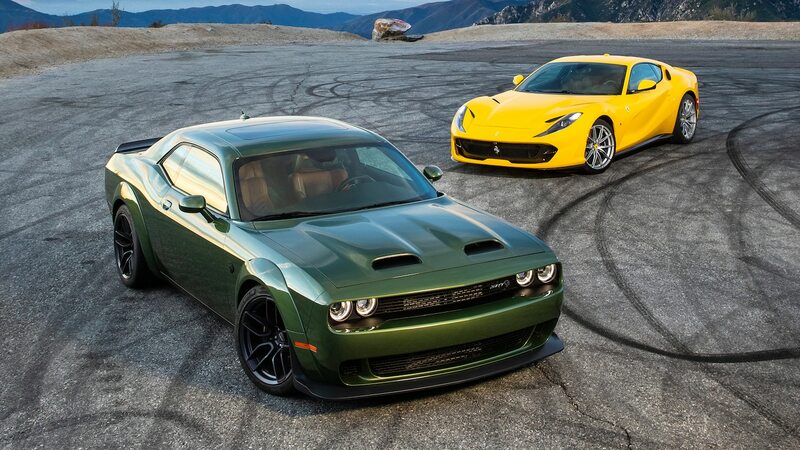 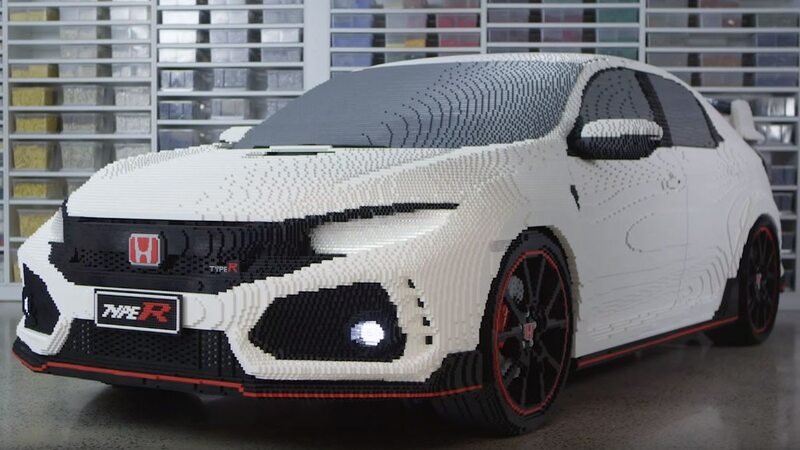 Read the full story on the Dodge and Ferrari right here. 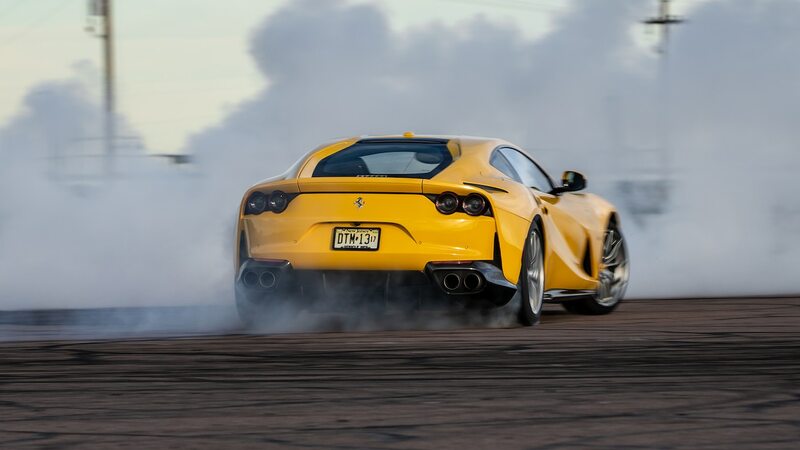 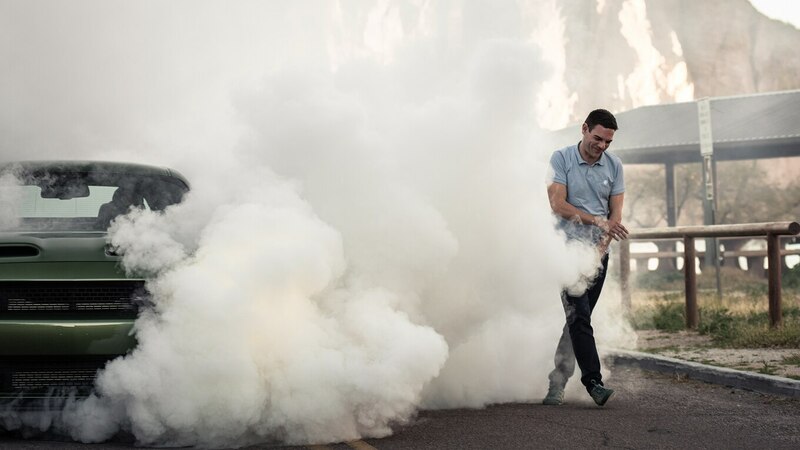 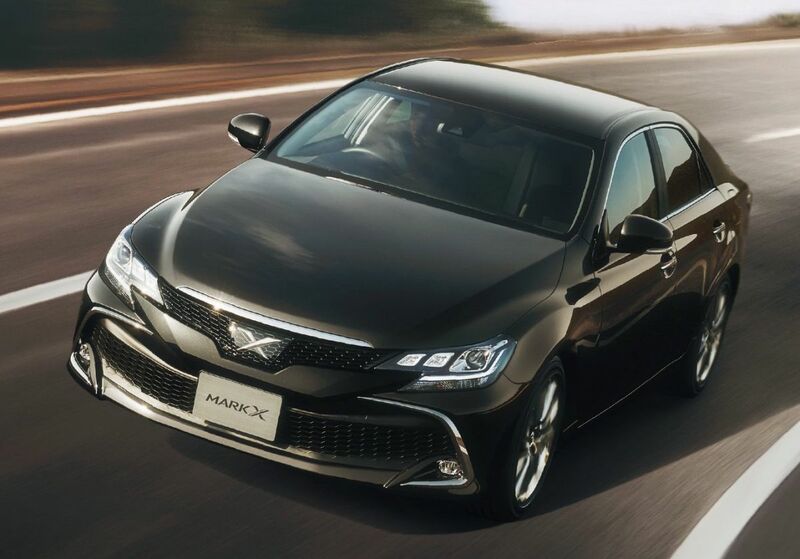 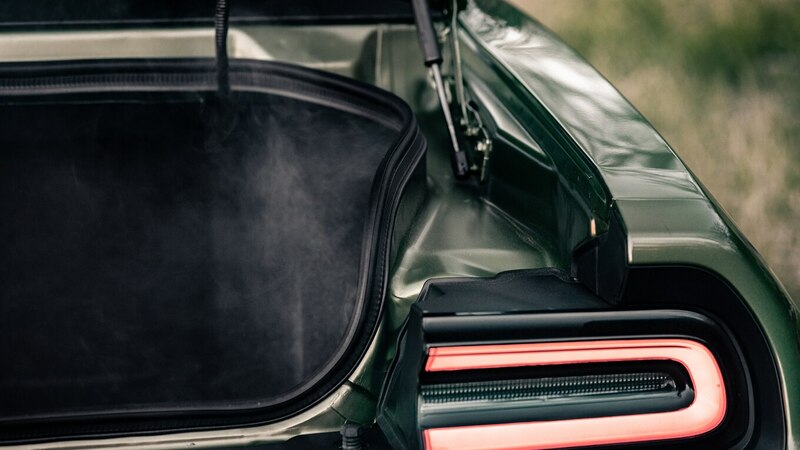 Typically speaking, if you’re at an actual drag strip, your car is launching atop a prepared surface and kitted out with some form of drag slick. 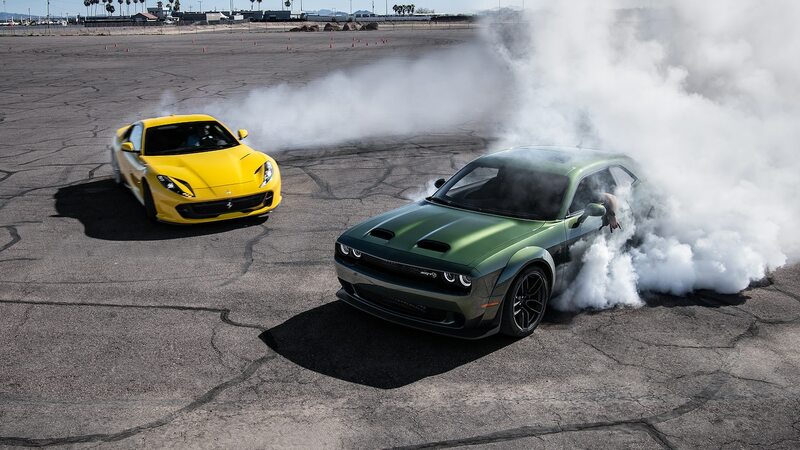 The latter is much better for traction. 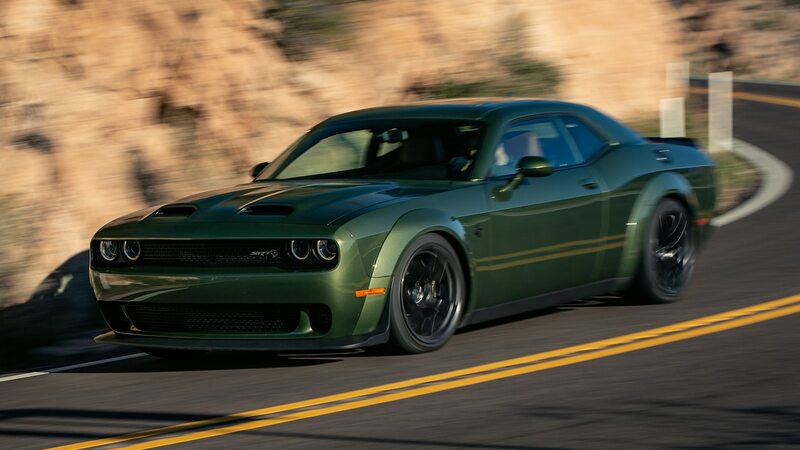 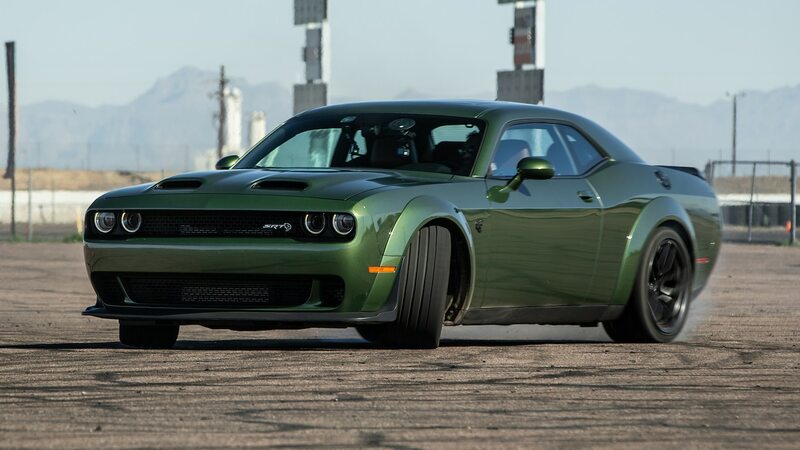 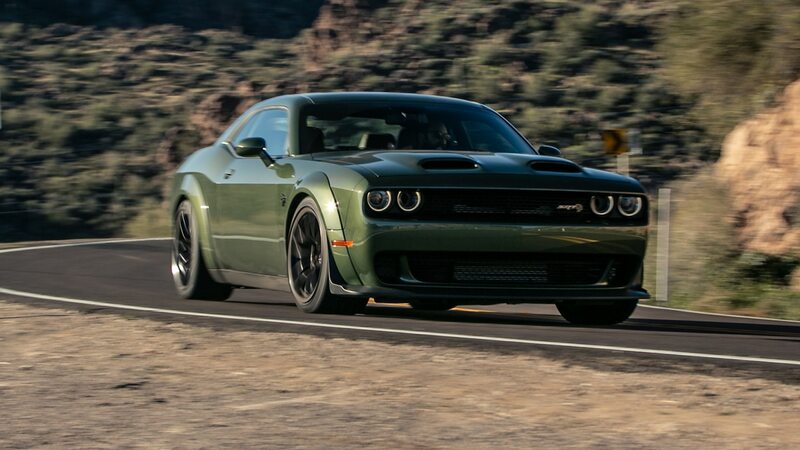 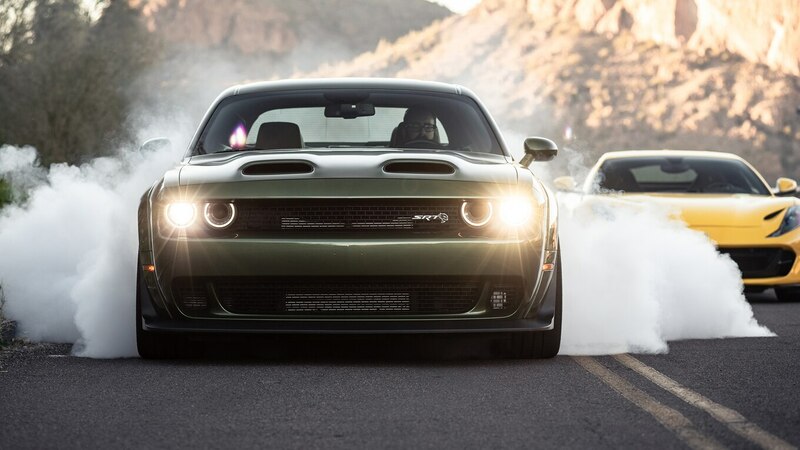 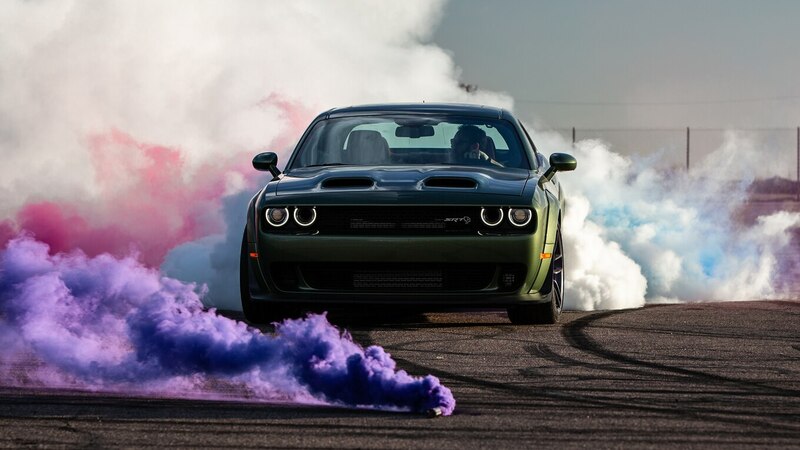 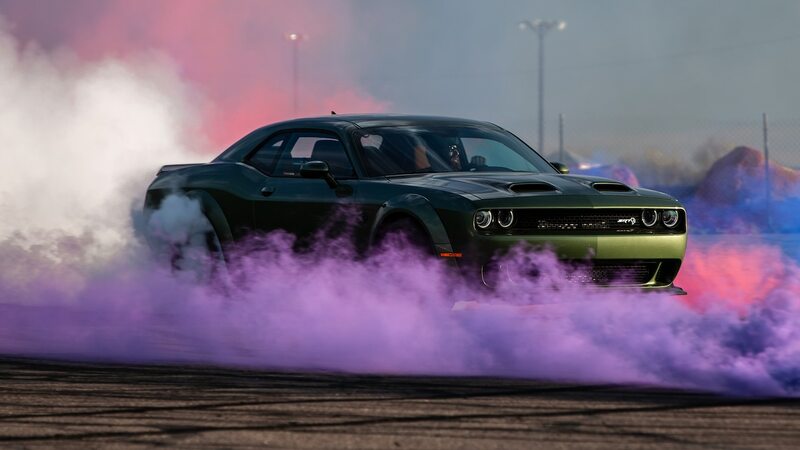 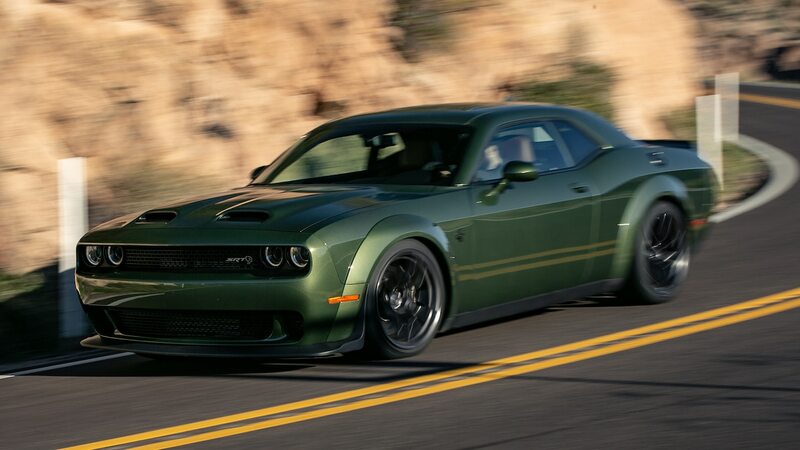 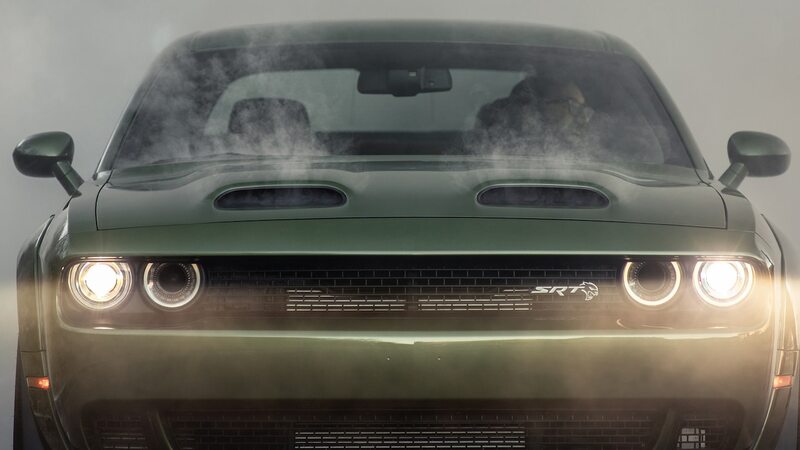 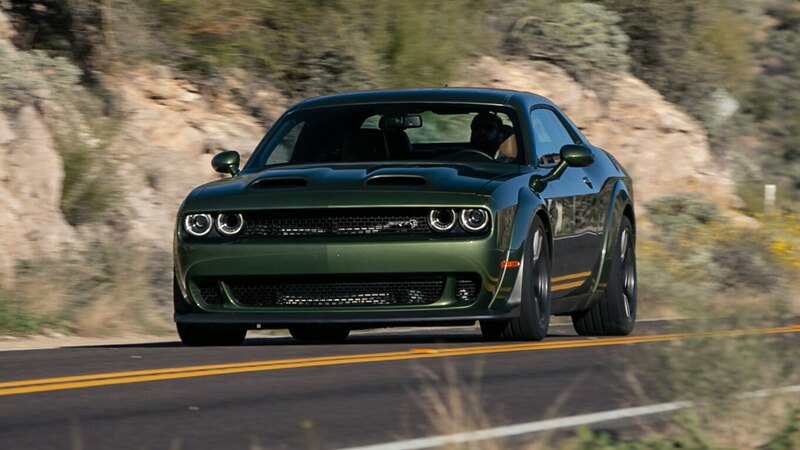 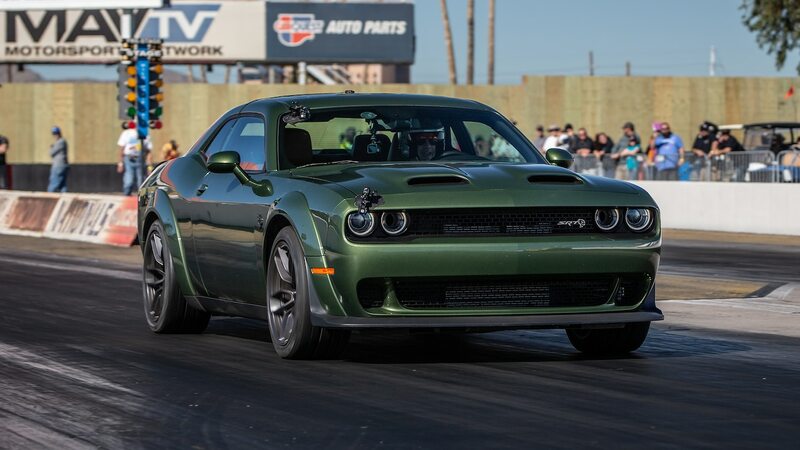 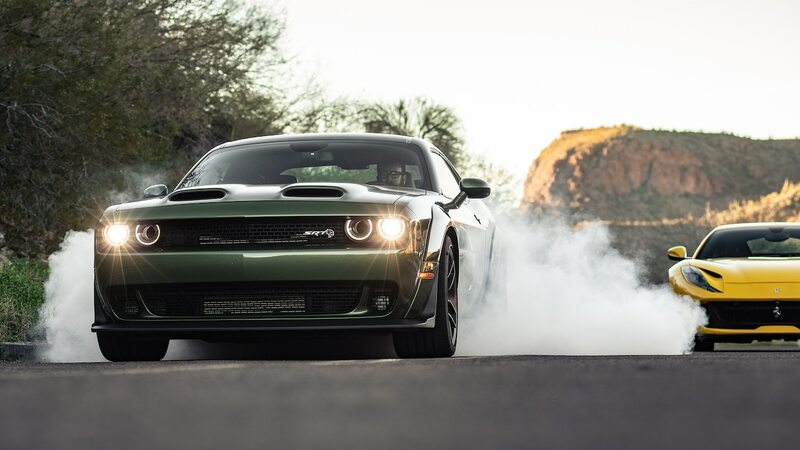 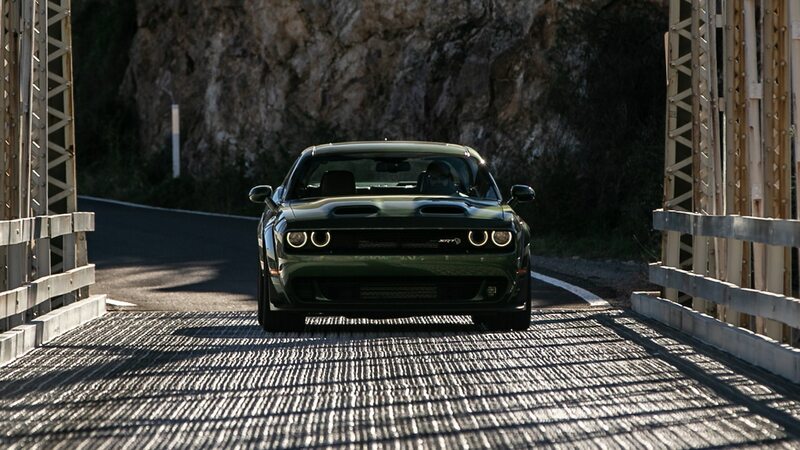 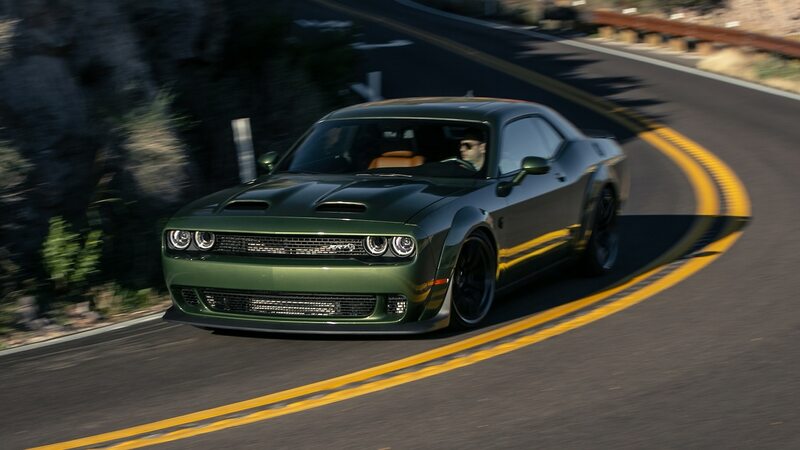 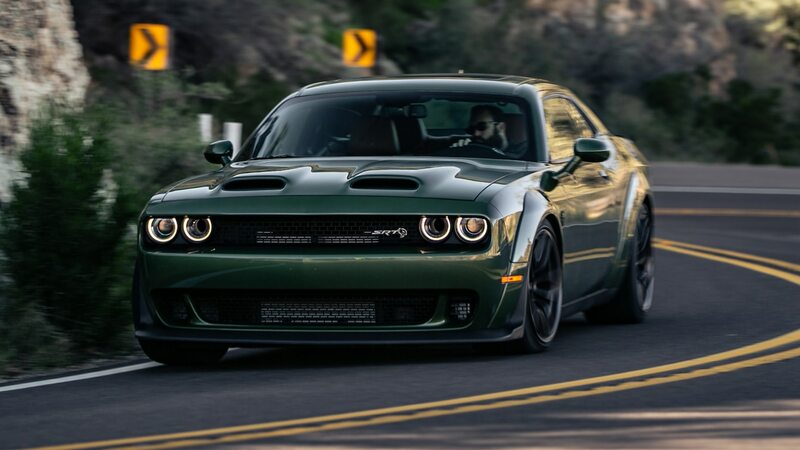 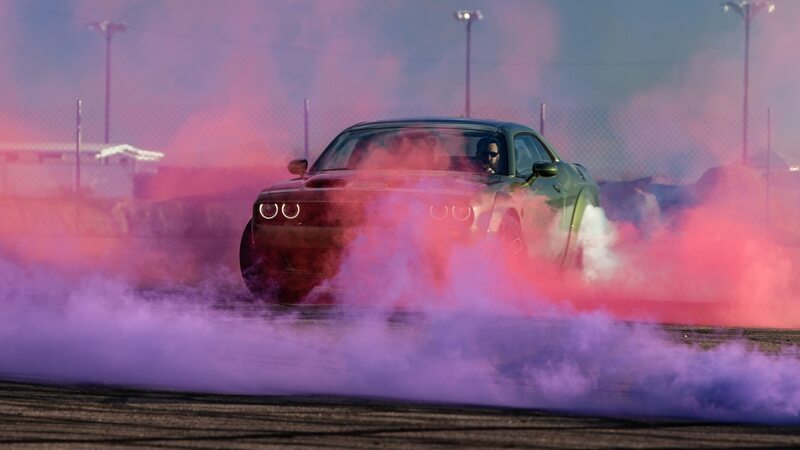 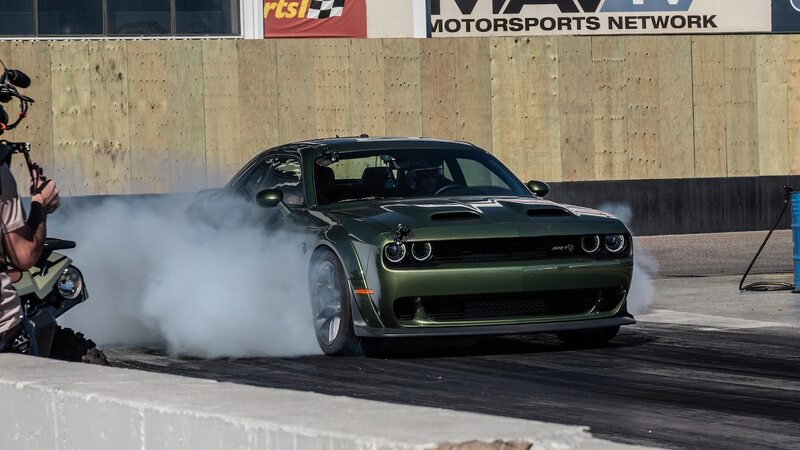 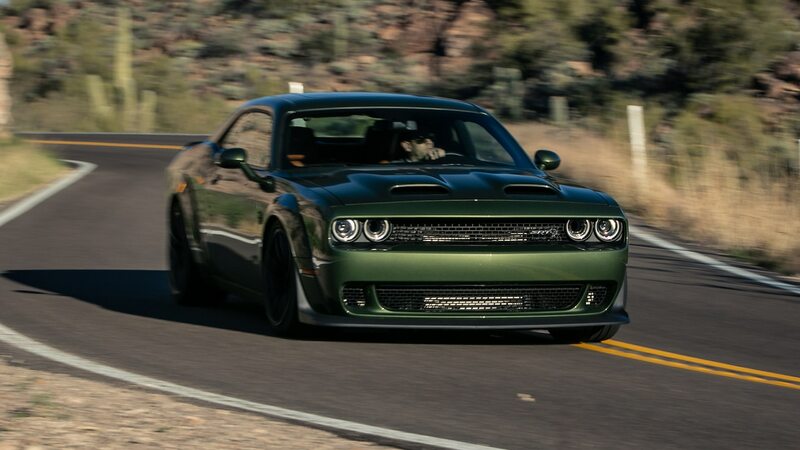 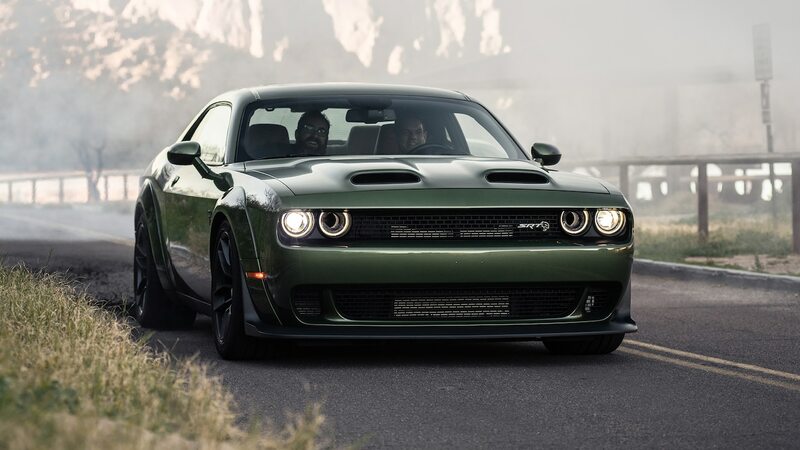 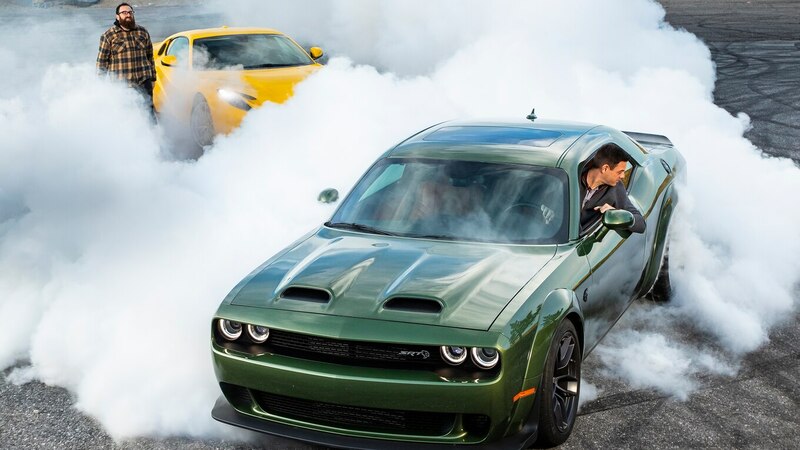 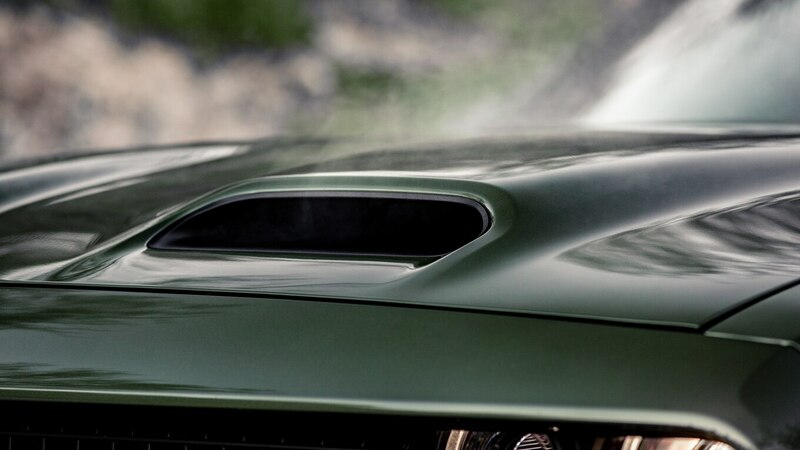 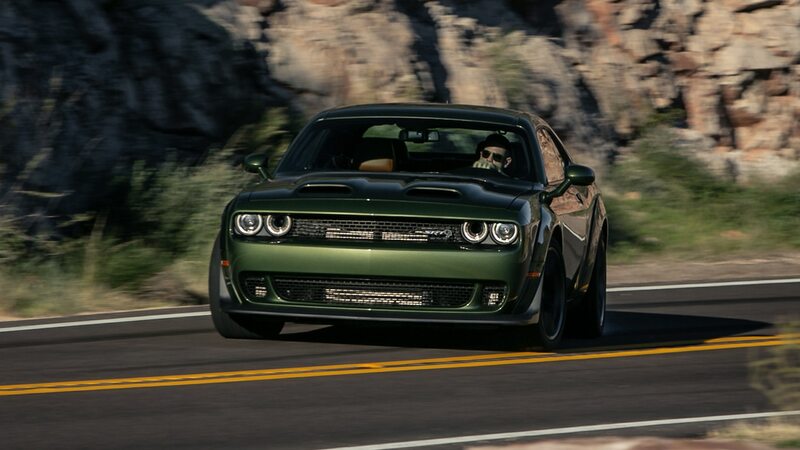 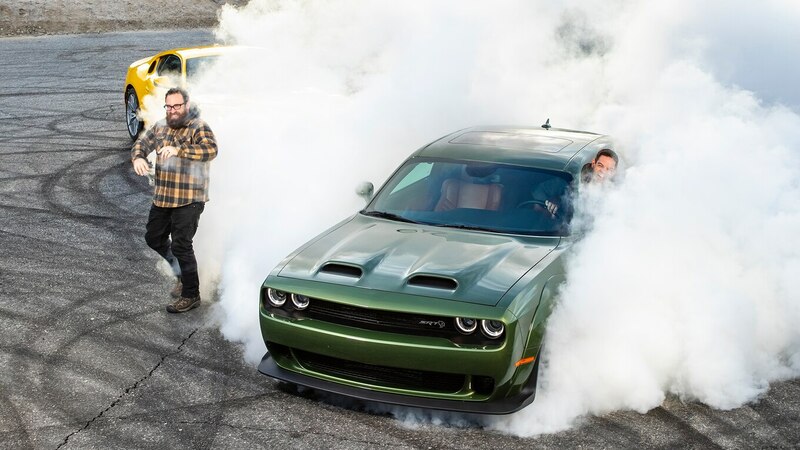 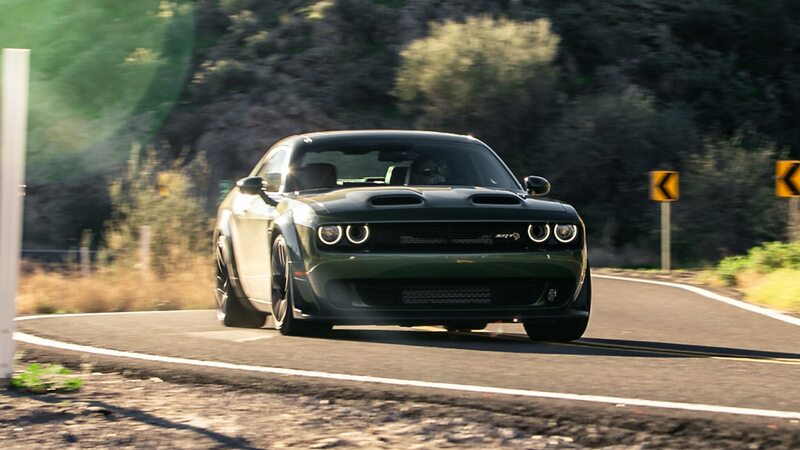 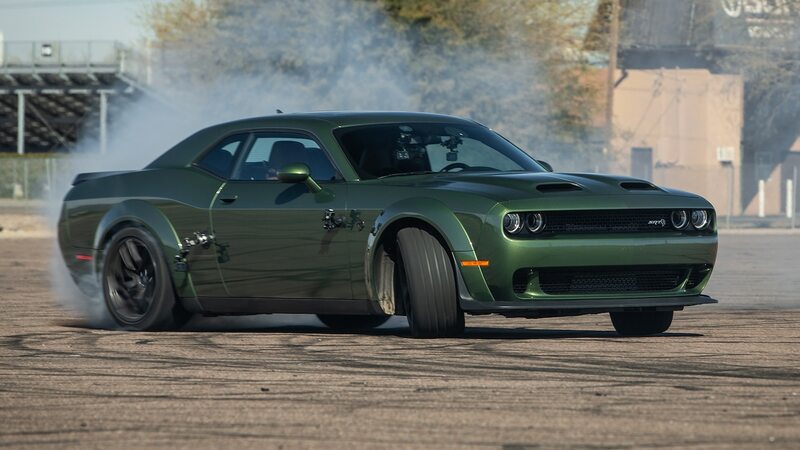 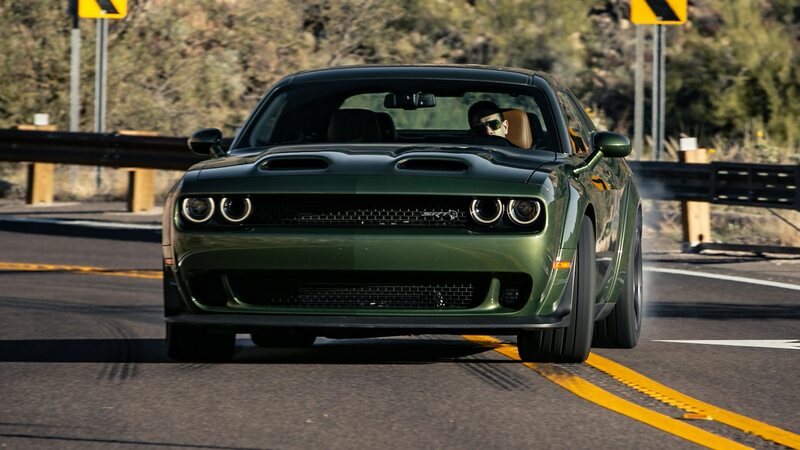 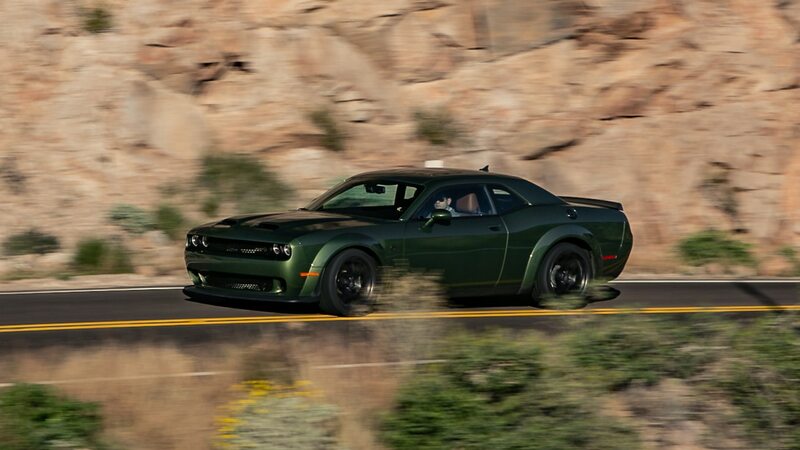 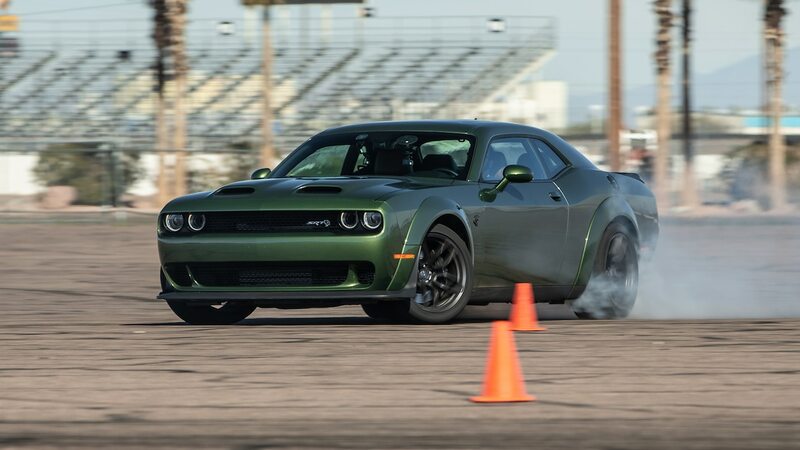 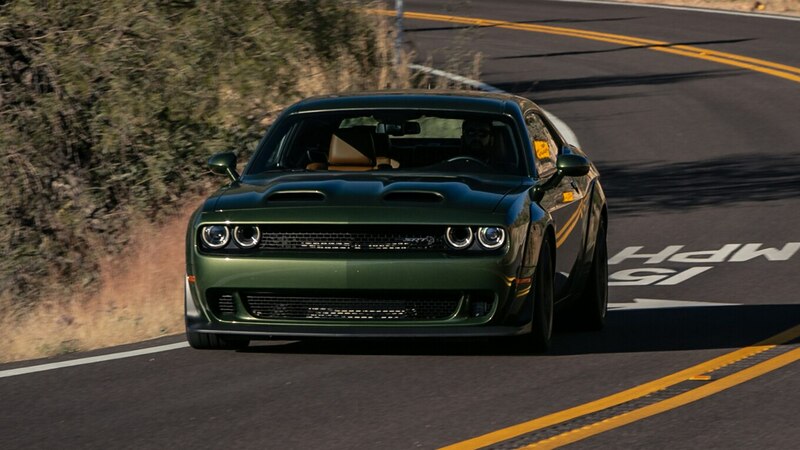 Why else do you think the Dodge Demon ran a 9.65-second quarter mile while the Hellcat Redeye here could only manage 11.8? 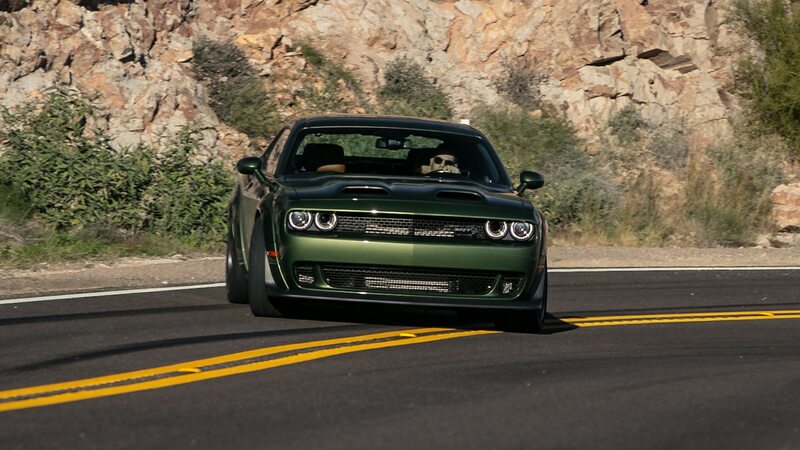 A scarier name? 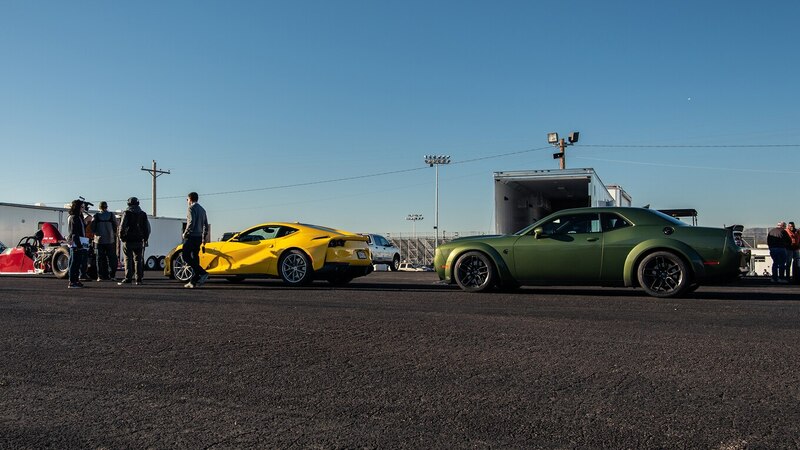 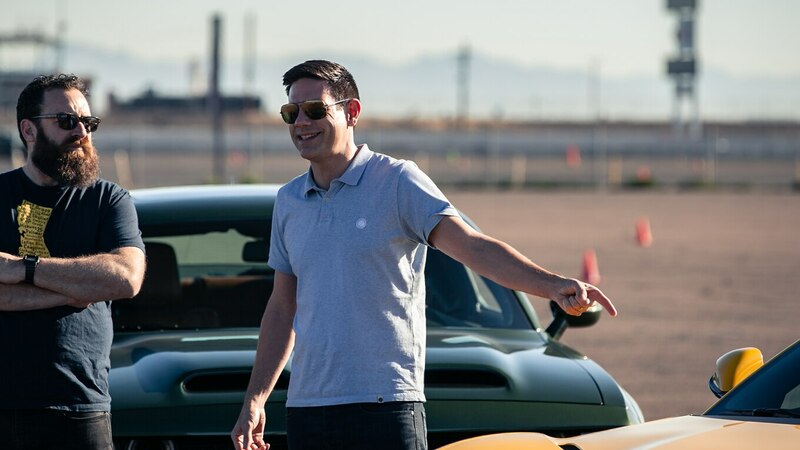 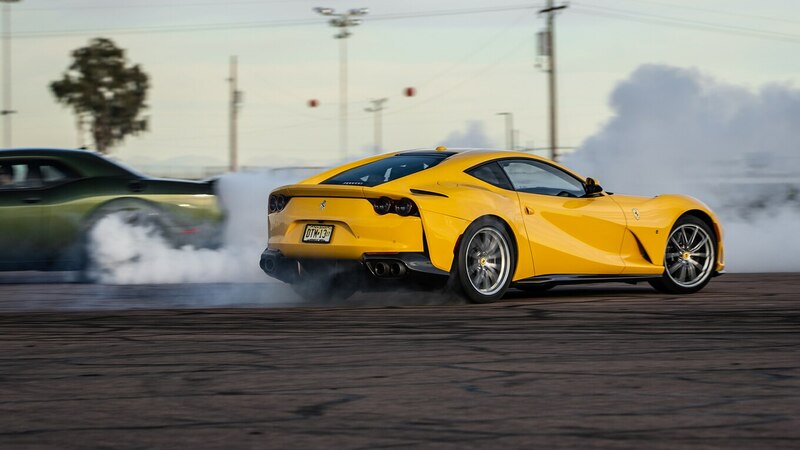 With that not necessarily in mind, yours truly and Jethro Bovingdon staged up the Italian and the American at the Christmas tree at Arizona’s Wild Horse Pass dragstrip to see what’s what. 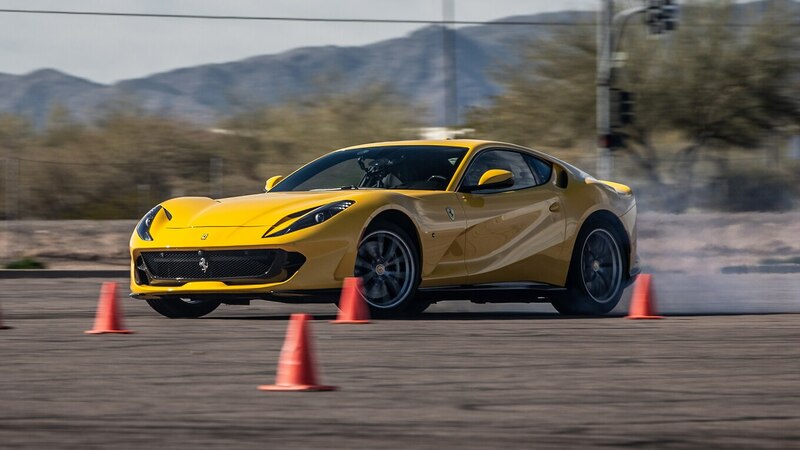 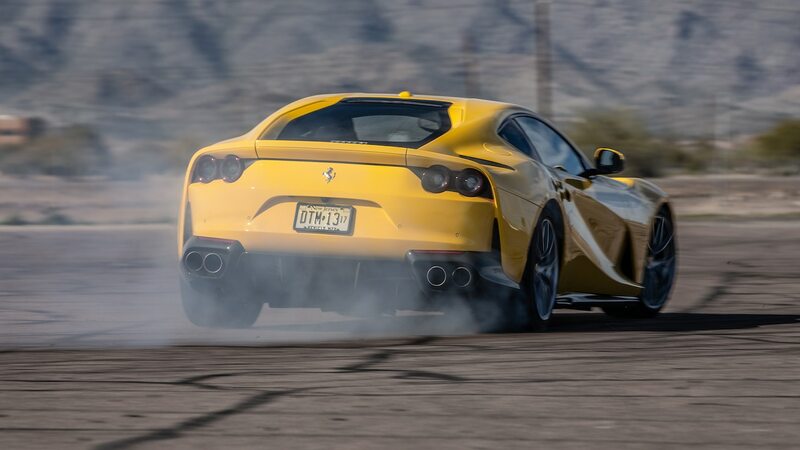 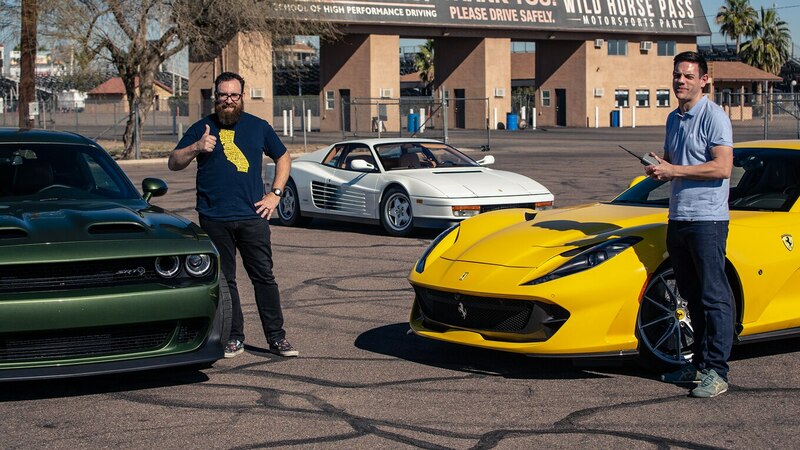 Results: Too bad the Ferrari can’t do a burnout. 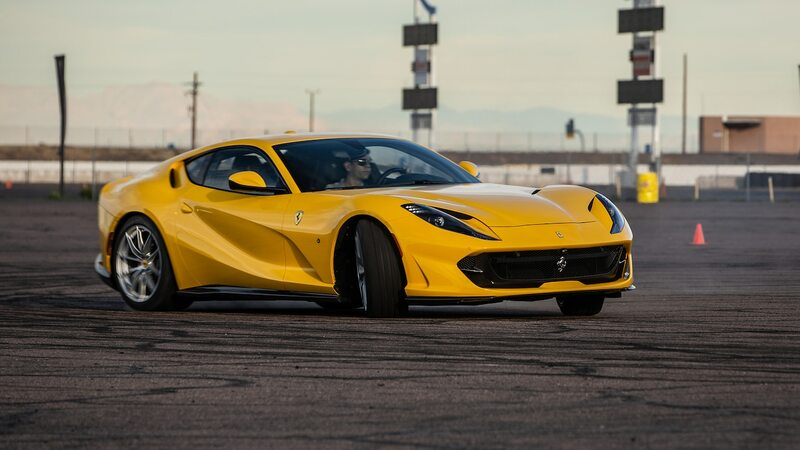 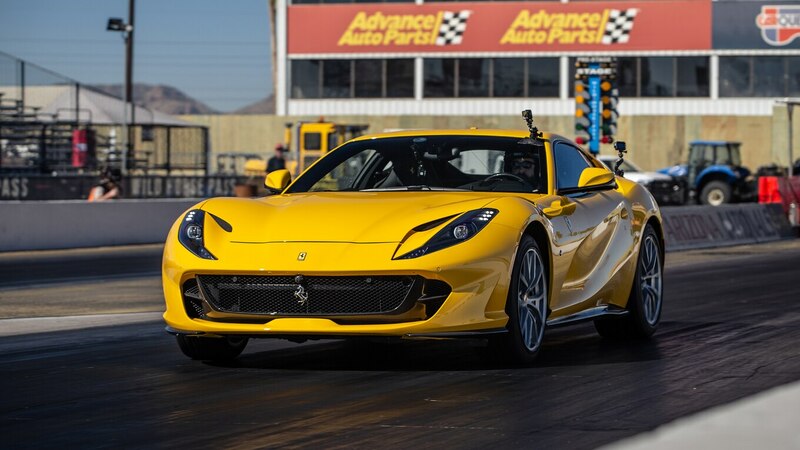 The best time I ran in the Superfast was 10.9 (10.852) seconds at 134.3 mph, compared to the 10.4 at 138.6 our Chris Walton laid down at our Fontana test site. 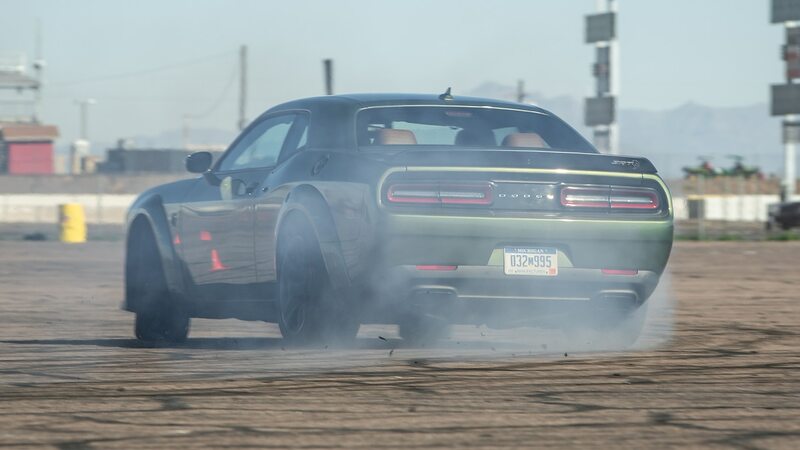 There was simply no way to get heat into the tires before each launch. 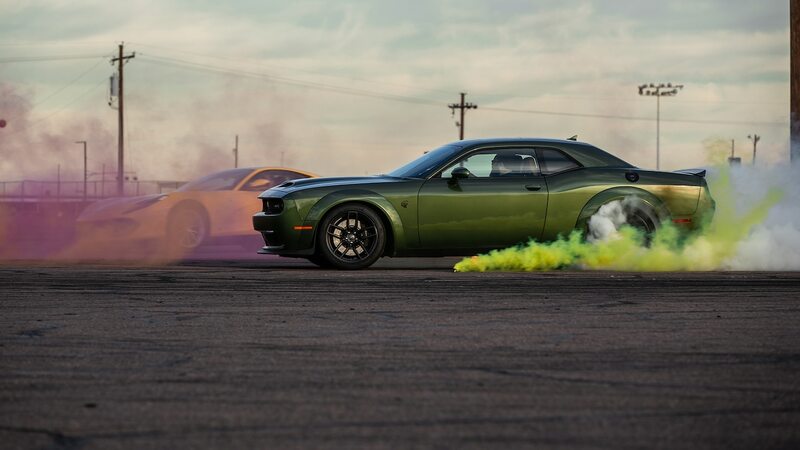 I’ll tell you this, however: Wanna get the respect of a bunch of strangers at a dragstrip? 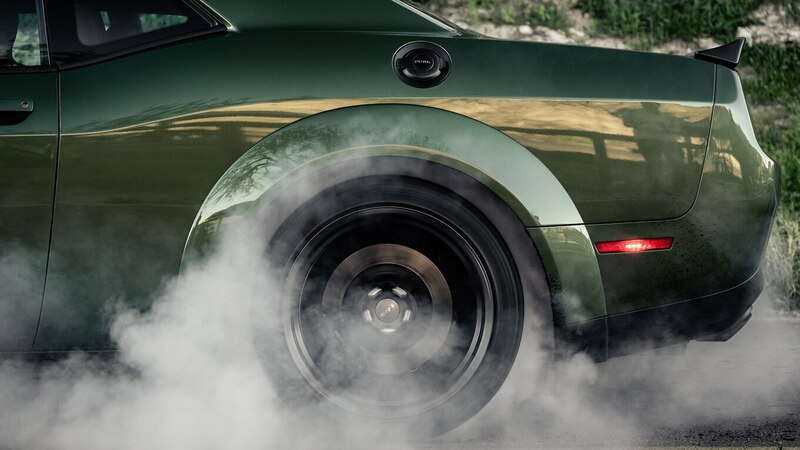 Run in the 10s on street tires. 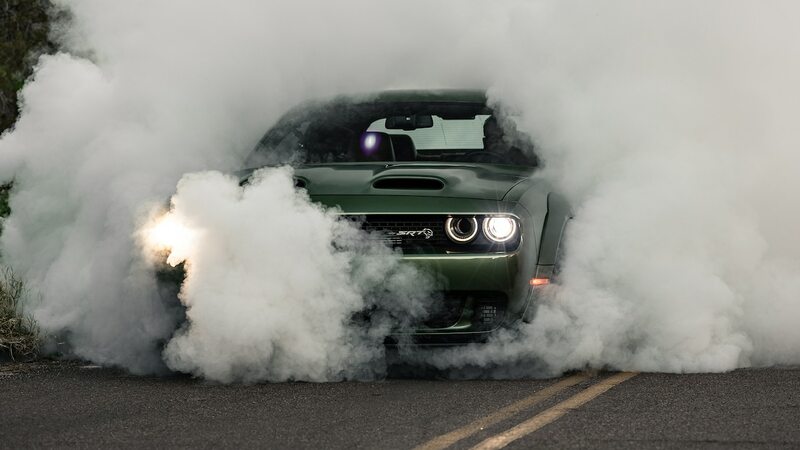 The Dodge has no issue whatsoever burning its tires. 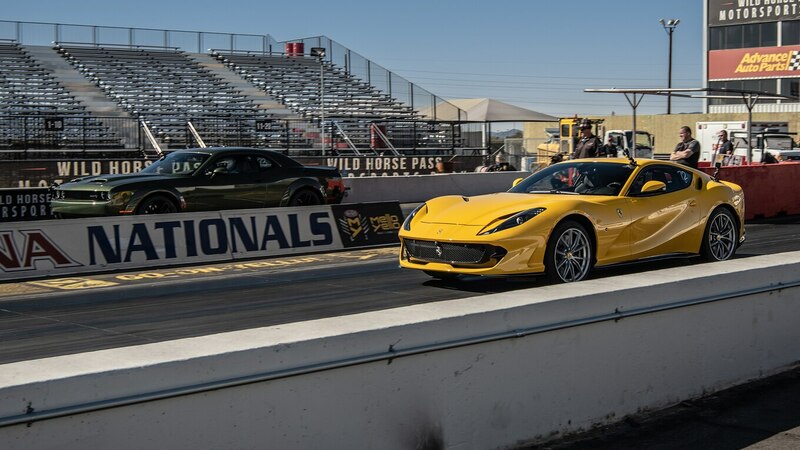 As such, Jethro was able to preheat the meats and then pop off a 12.0-second run (11.998) at 125.4 mph, a deficit of just 0.2 second and less than 3 mph compared to our Fontana times. 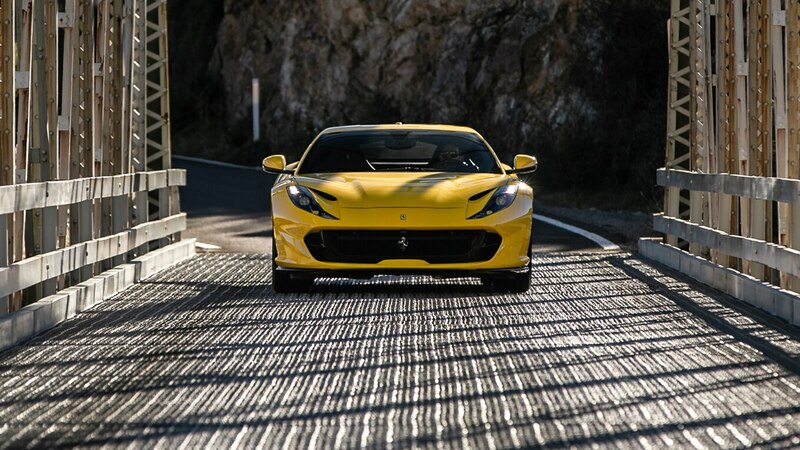 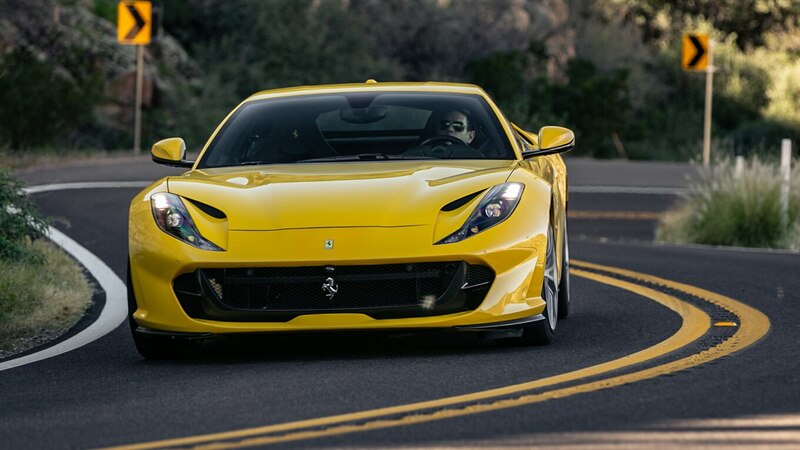 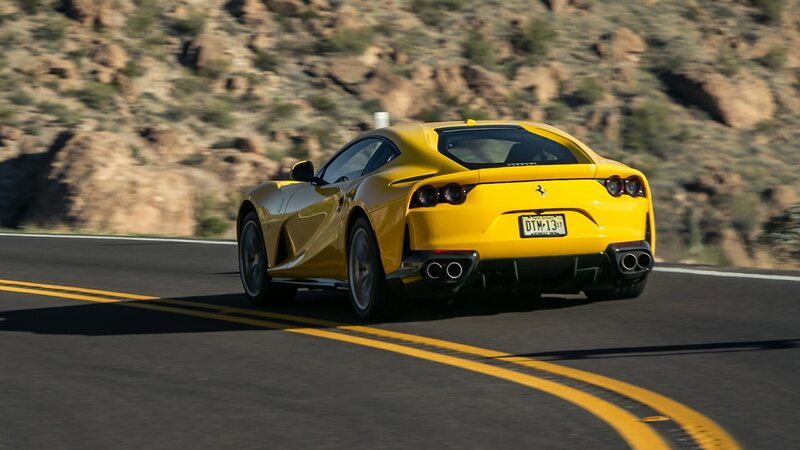 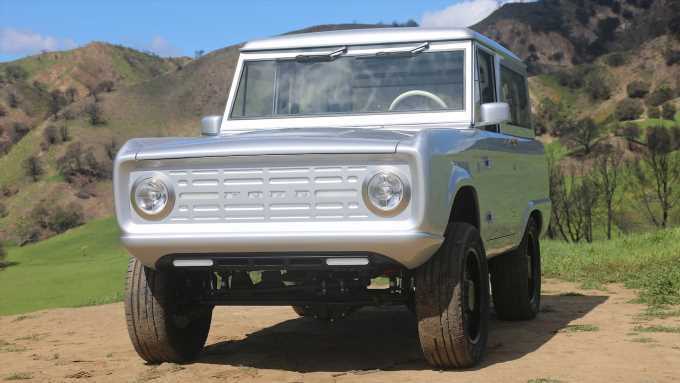 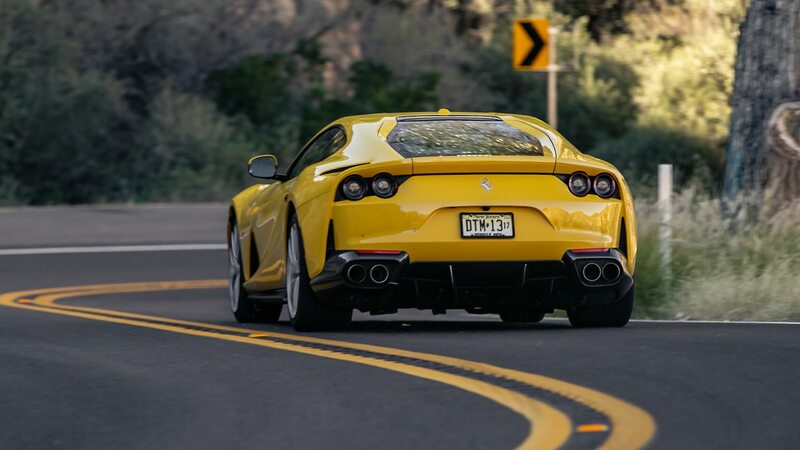 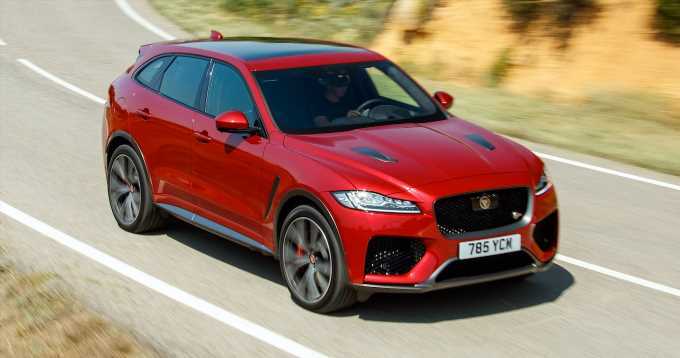 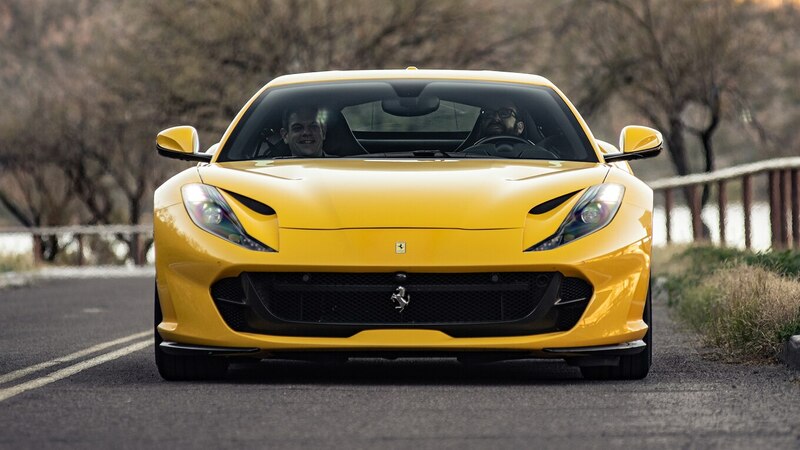 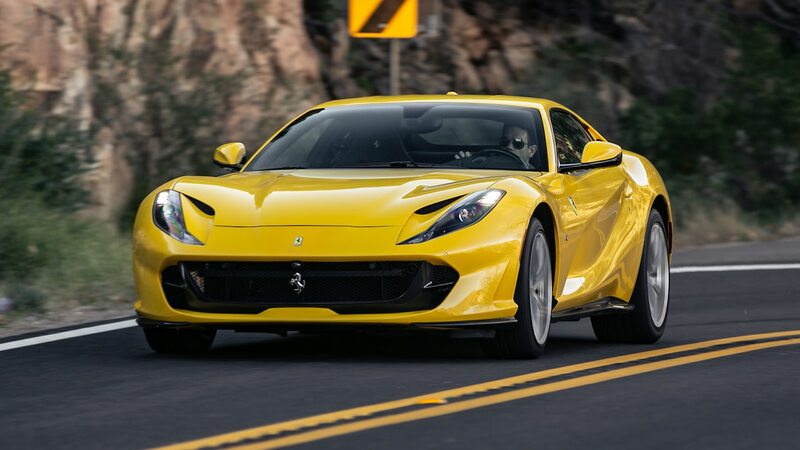 Although the Ferrari was the victor, the Redeye was able to achieve more of its potential. 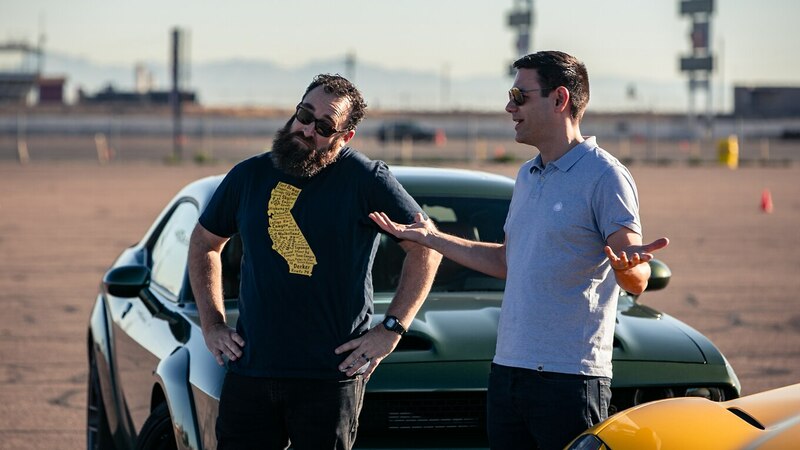 What’d we learn? 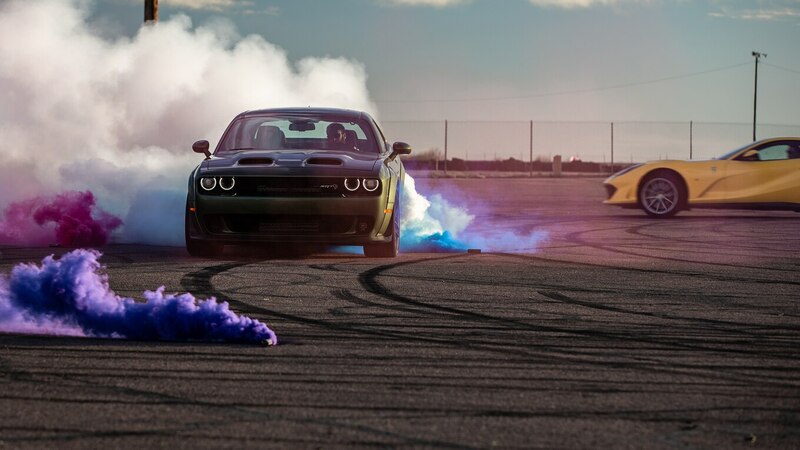 Next time we’ll bring slicks.